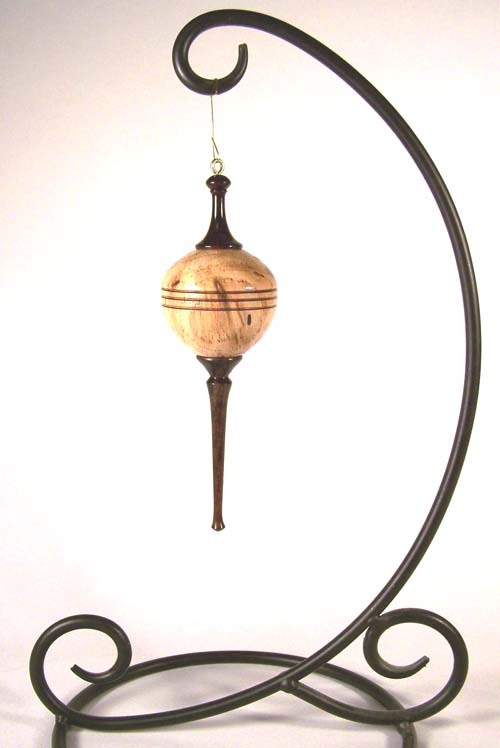 d) small to large "hollow globe" ornaments with decorative finals and icicle spindles. 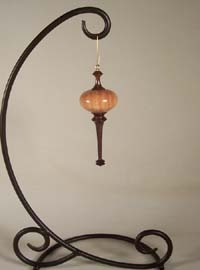 However, as you can see in the most recent additions, my favorites are the hollow-globe style. 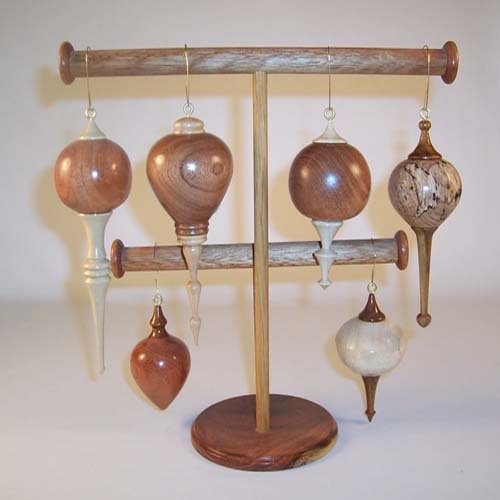 These are truly Texas Christmas ornaments - each one is crafted here in Texas using local woods - primarily Honey Mesquite, Texas Ebony, Huisache, Live Oak and spalted Pecan. Most of this Texas wood has been harvested (usually by me) from the margins of the Katy Prairie, usually from downed trees or those that would be removed for reasons other than just my woodworking. 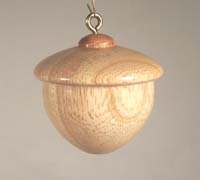 Each ornament is generally finished with glossy lacquer, although I sometimes use an initial coat of Danish oil to enhance the woods grain. All of these ornaments are handmade individually and each is unique - no two are alike. 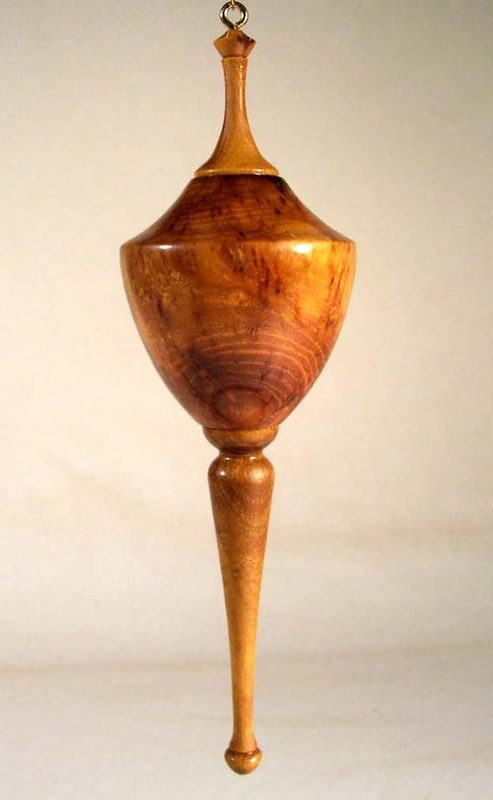 While I do employ the same types of wood, in similar basic styles, the final shape depends on my mood and what I see in the wood as it is being turned. I hope you like them. 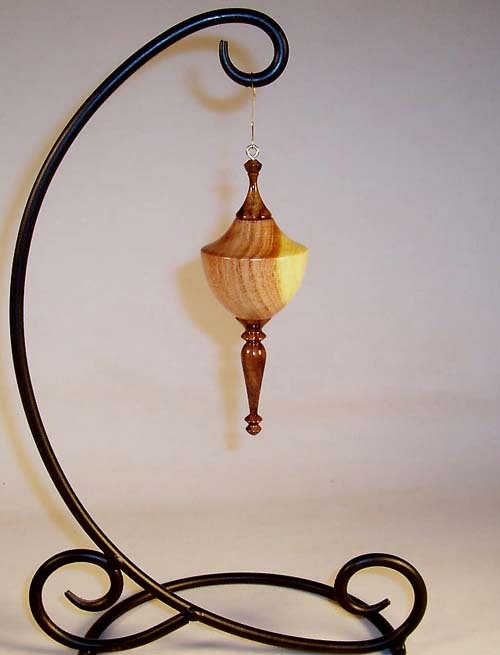 Please note - that stand is not included with the ornaments, and NO - it is not for sale separately. If you like the woods I'm using in these ornaments, you can find similar woods for sale on our companion website, TexasWoodcrafts.net. This is an attractive ornament with a crown-shaped globe turned from Texas Honey Mesquite. The globe has been hollowed to produce a very light-weight ornament. 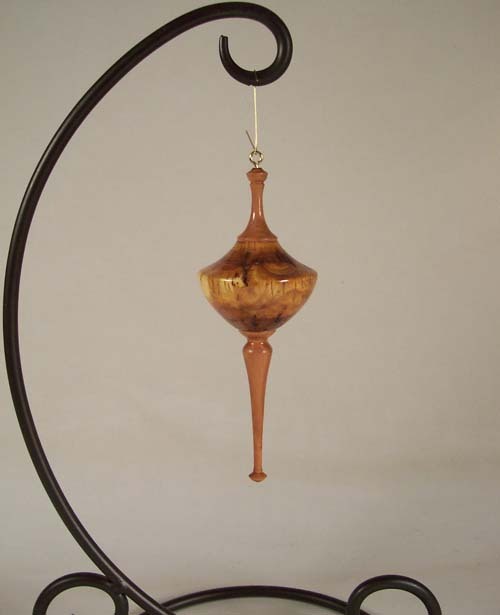 The icicle and capping finial were turned from the very dark brown-black heartwood of our native Texas Ebony tree. 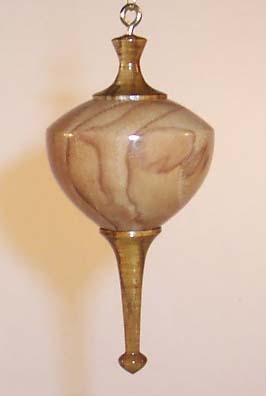 This ornament is about 6-3/4" tall and 1-3/4" wide. 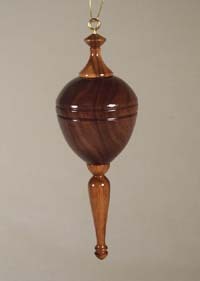 It was well sanded and finished with multiple coats of lacquer. 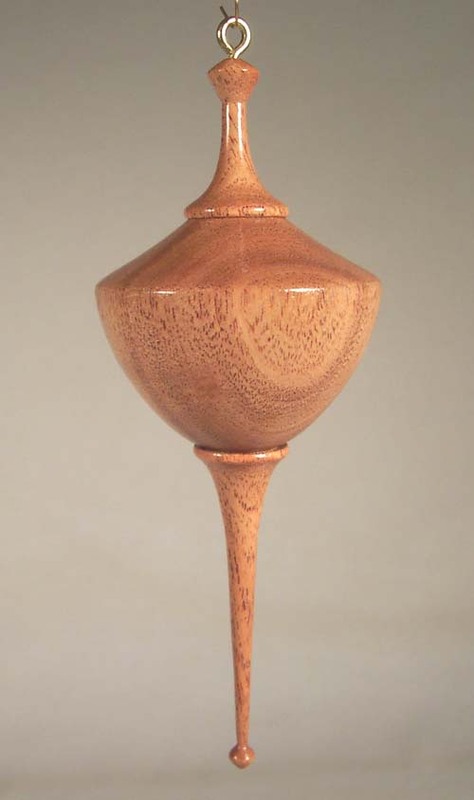 This is a beautiful, small and delicate, crown-shaped ornament turned from moderately-burly Texas Honey Mesquite. It includes a eye-catching complex grain with numerous grain-crossing rays. 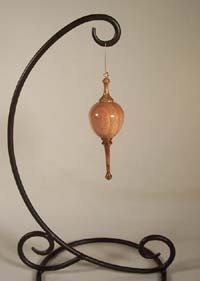 It has also been hollowed to produce a very light-weight ornament. The icicle and capping finial were turned from the very dark brown-black heartwood of our native Texas Ebony tree. This ornament is about 4-1/2" tall and 1-1/4" wide. 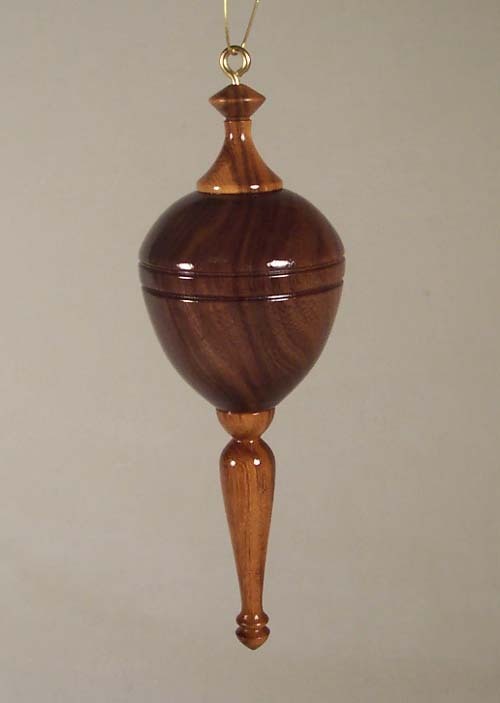 It was well sanded and finished with multiple coats of lacquer. 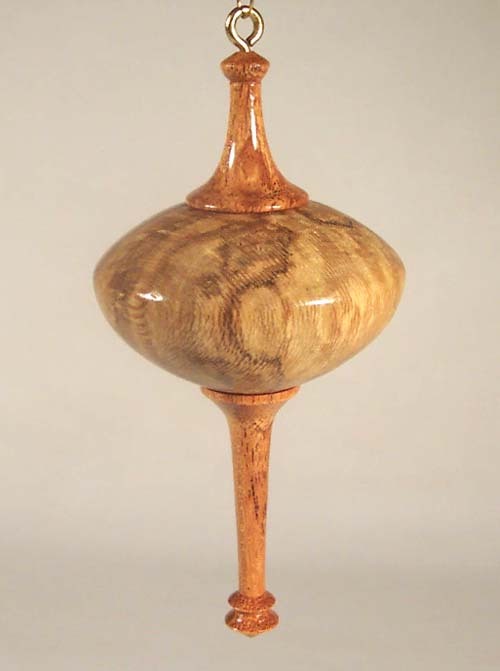 This is a beautiful crown-shaped ornament turned from heavily-spalted, native Texas Pecan. 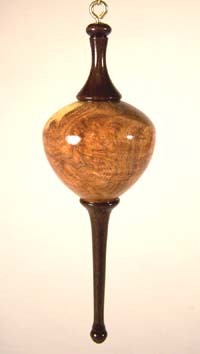 The spalting resulted in an absolutely gorgeous black, pencil-line spalting pattern throughout the soft brown heartwood. This larger globe has also been hollowed to produce a very light-weight ornament. 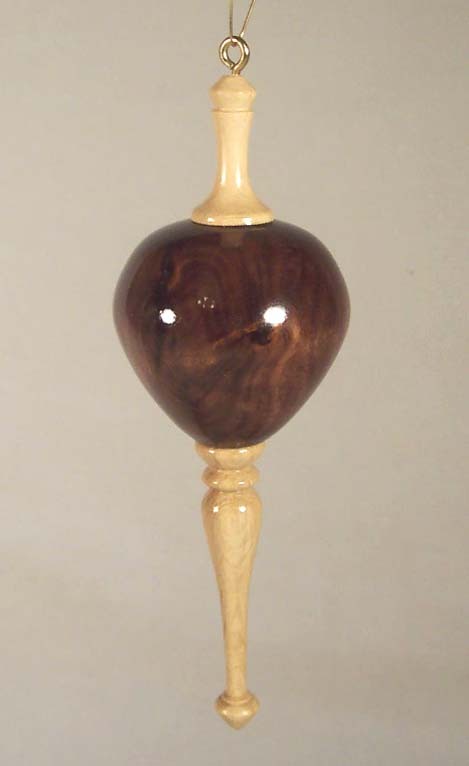 The icicle and capping finial were turned from the very dark brown-black heartwood of our native Texas Ebony tree. 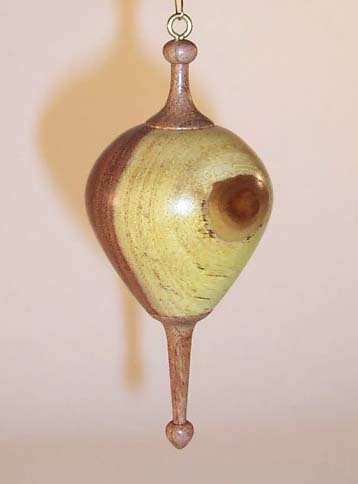 This ornament is about 5-1/4" tall and 2" wide. 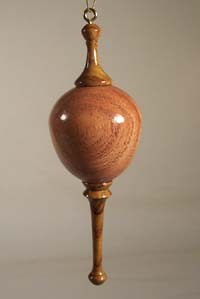 It was well sanded and finished with multiple coats of lacquer. This is another beautiful ornament turned from heavily-spalted, native Texas Pecan. The globe is a flattened oval form (my friend says "UFO style). The heavy spalting of this Pecan wood resulted in an absolutely gorgeous black, pencil-line spalting pattern throughout the tan to soft brown heartwood. This globe is about as large as I like to make them, and while it has been hollowed-out to reduce the weight, it is heavier than most and will likely work best on the inner portion of that Christmas tree limb. 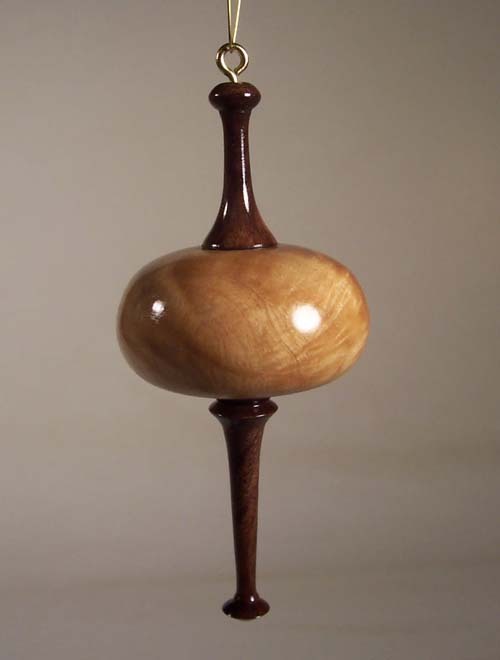 In this case, I chose to turn the icicle and capping finial from Texas Black Walnut. 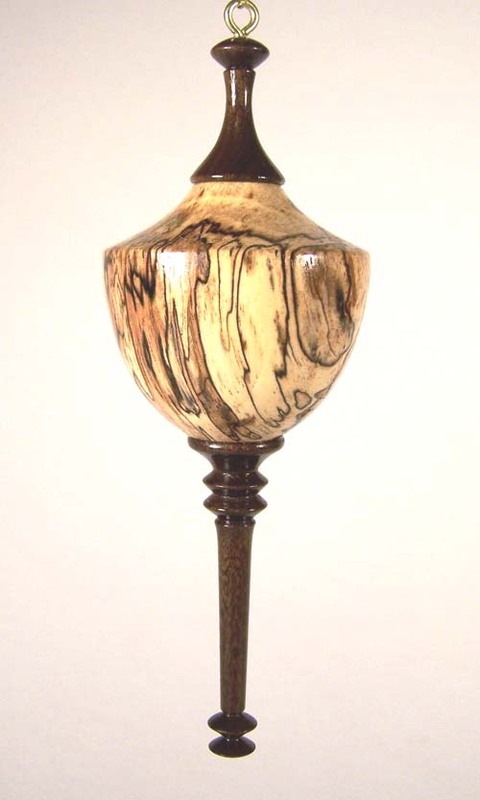 The light brown of the Walnut heartwood goes well with the various brown shadings of the spalted Pecan globe. The dimensions are approximately 6-1/4" by 2-1/2" wide. It has been well sanded and finished with multiple coats of lacquer. 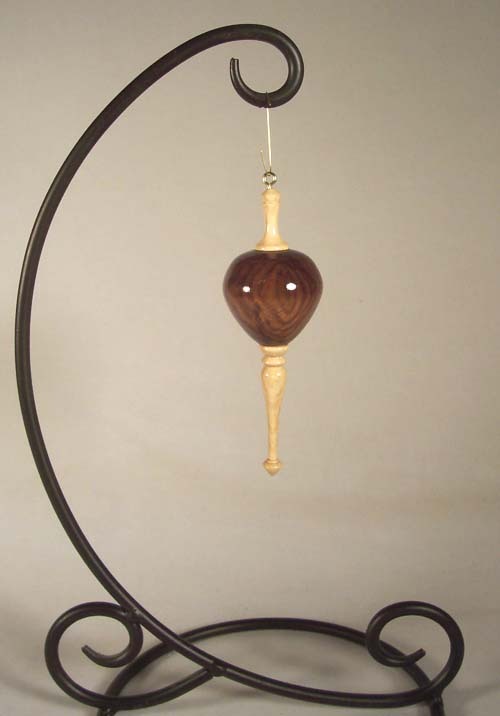 This is a very nice ornament with a crown-shaped globe turned from very dark brown Texas Black Walnut heartwood. 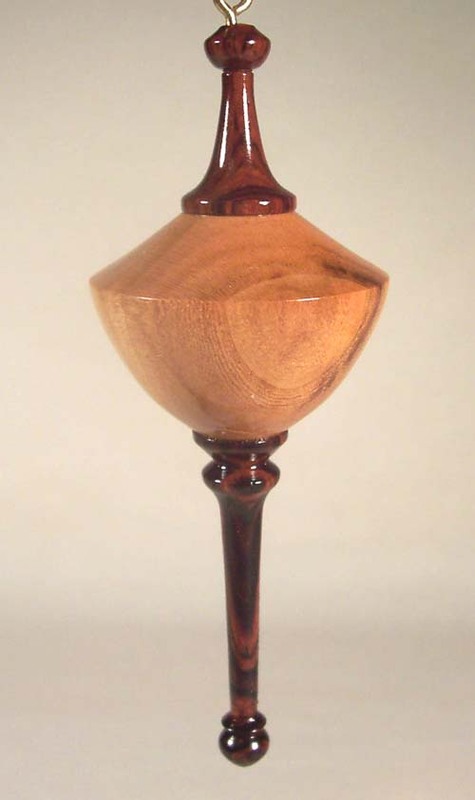 The icicle and capping finial were turned from Crepe Myrtle. This ornament is about 5-3/4" tall and 2" wide. 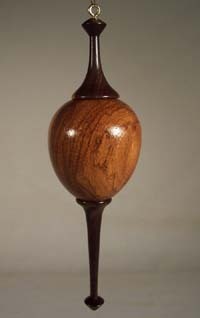 It was well sanded and finished with multiple coats of lacquer. This is a very nice ornament with an elongated globe turned from rosy-red Texas Huisache (aka Sweet Acacia). 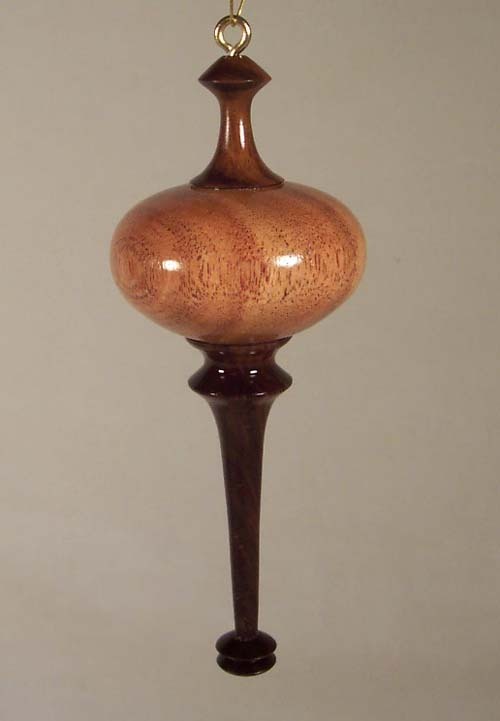 The icicle and capping finial were turned from a piece of Texas Ebony that includes both dark brown-black heartwood and light brown/tan sapwood. 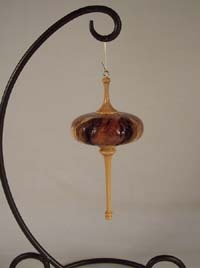 The dimensions are approximately 6-3/8" by 1-3/4". 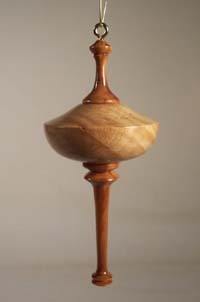 It was sanded very well and finished with multiple coats of lacquer. This is another very pretty ornament with a top-shaped globe turned from "Purple Heart" Texas Eastern Red Cedar. 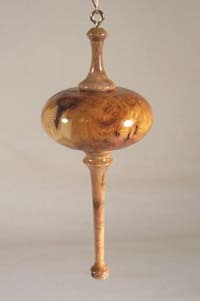 The icicle and capping finial were turned from light brown Texas Live Oak. The dimensions are approximately 6-1/4" by 2". 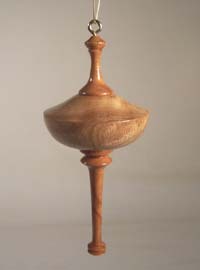 It was sanded very well and finished with multiple coats of lacquer. 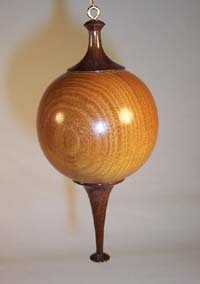 This is another fairly large and beautiful Texas wood ornament. The globe was turned in an overall spinning-top shape from heavily-spalted, native Texas Pecan. 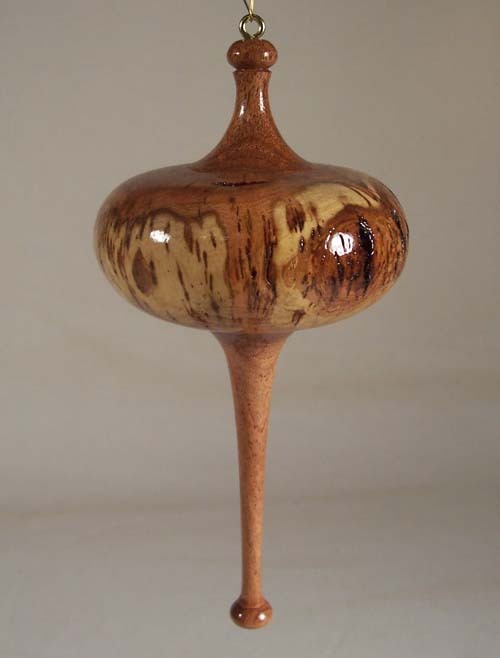 The heavy spalting of this Pecan wood resulted in an absolutely gorgeous black, pencil-line spalting pattern throughout the tan to soft brown heartwood. 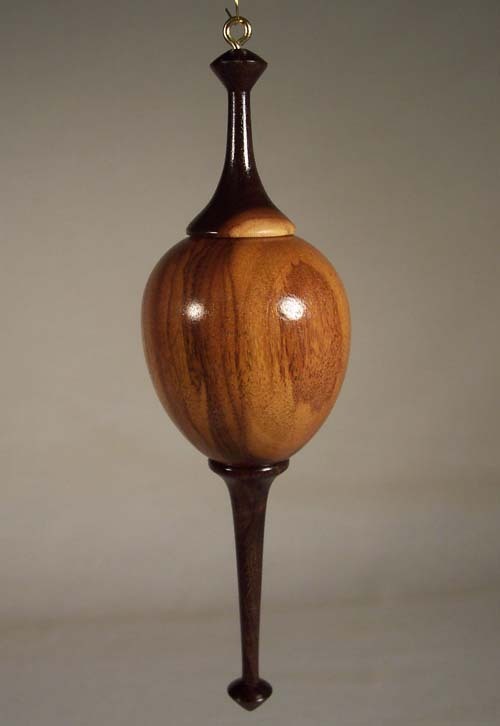 I chose to turn the icicle and capping finial from native Texas Ebony. 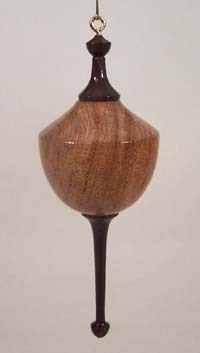 The dark brown to black color of the Texas Ebony heartwood goes well with the black pencil-line spalting of the Pecan globe. 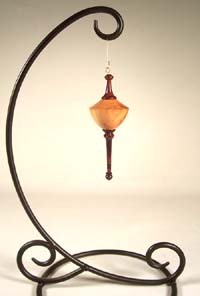 The dimensions are approximately 6" long by 2-3/8" wide. It has been well sanded and finished with multiple coats of lacquer. 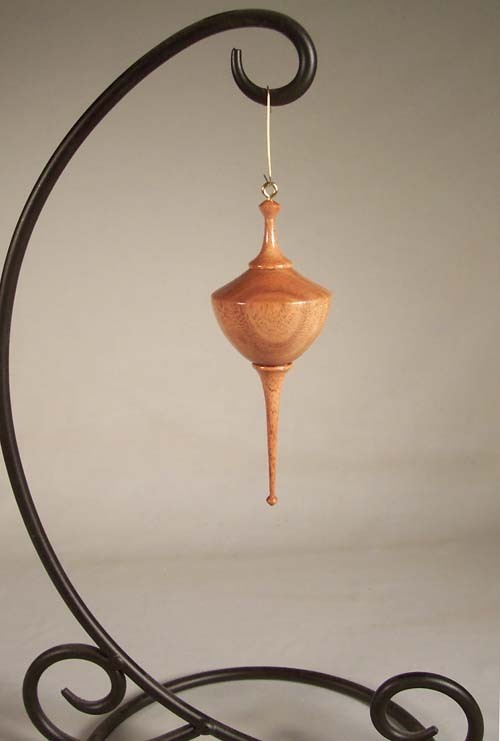 This is another beautiful, small and delicate, top-shaped ornament turned from moderately-burly Texas Honey Mesquite. It includes a eye-catching complex burly grain along with a small patch of golden-yellow sapwood on part of the shoulder. 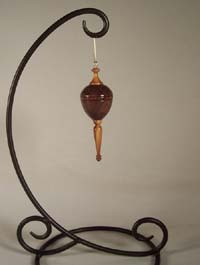 The icicle and capping finial were turned from the very dark brown-black heartwood of our native Texas Ebony tree. 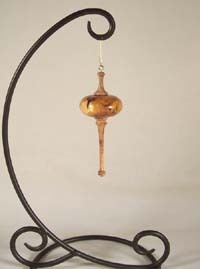 This ornament is about 5-1/4" tall and 1-3/4" wide. 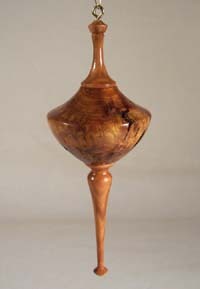 It was well sanded and finished with multiple coats of lacquer. This is a very nice crown-shaped ornament turned from our Texas Honey Mesquite. 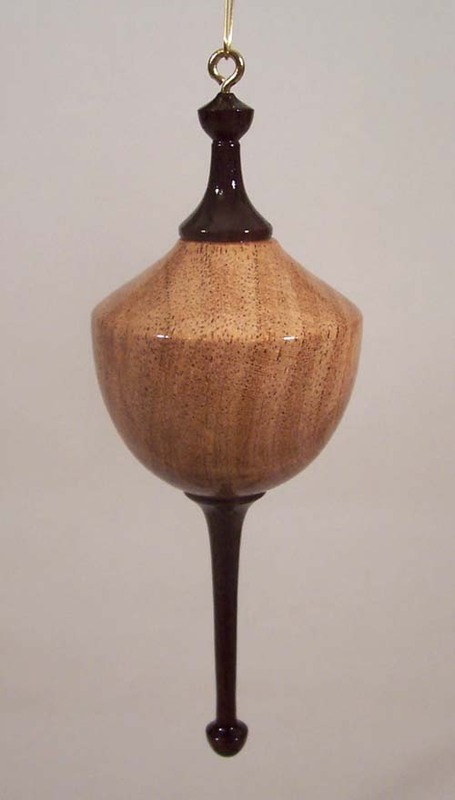 It was cut from very close to the center of the log and includes a strong and attractive linear grain pattern, and the rich, reddish-brown color of Honey Mesquite heartwood. The icicle and capping finial were turned from the very dark brown-black heartwood of our native Texas Ebony tree. 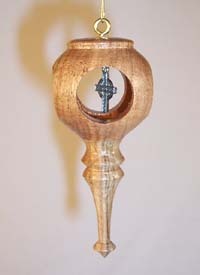 The overall size is about 5-1/2" tall and 2-1/4" wide. 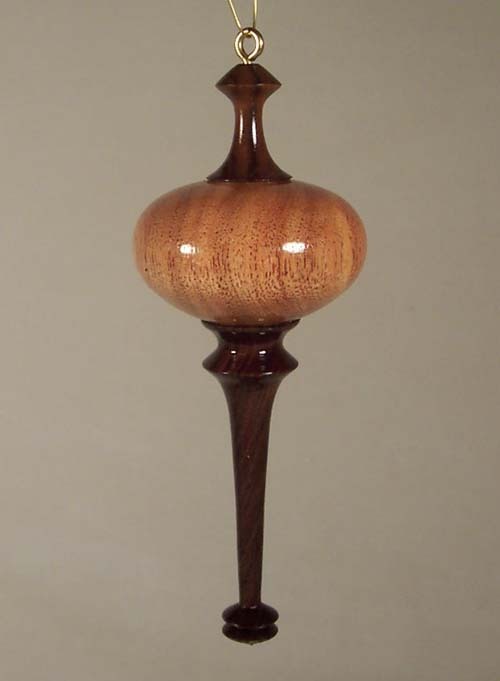 It was well sanded and finished with multiple coats of lacquer. This is a very nice, essentially round ornament, also turned from spalted, native Texas Pecan. 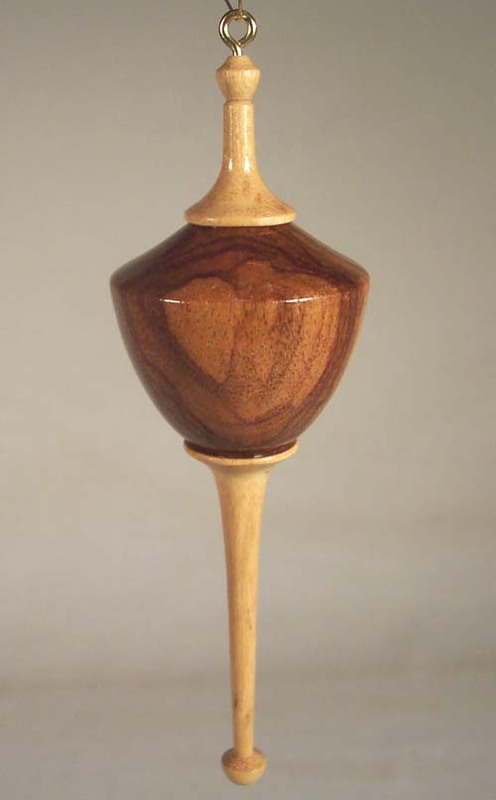 The spalting also includes strong, black pencil-line patterns within the soft brown heartwood. 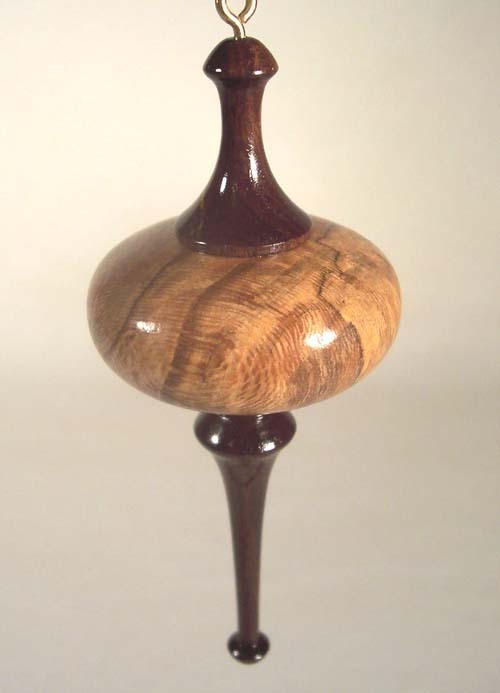 However, those spalt-patterns are not as extensive as in some of my other Pecan ornaments, so I decided to spice it up a bit by adding three black-burnished stripes/grooves around the center of the globe. I think it turned out quite nice. The icicle and capping finial were turned from the very dark brown-black heartwood of our native Texas Ebony tree, and the color goes well with the spalted and burnished lines. 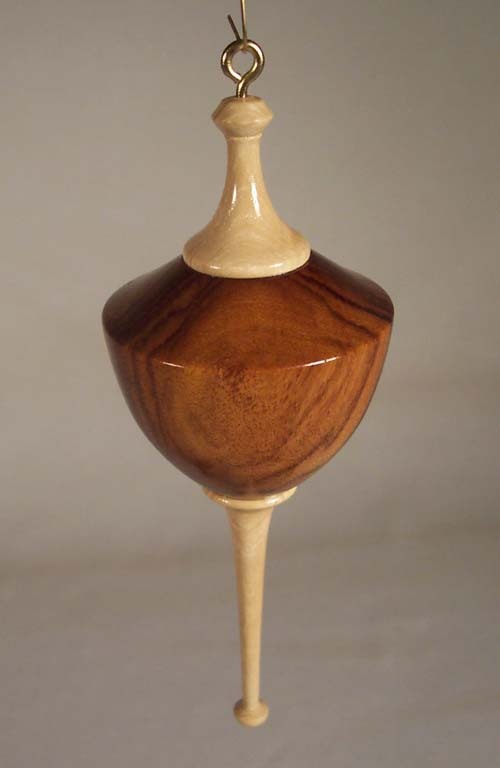 The overall dimensions of this piece are about 6-1/4" by 2". 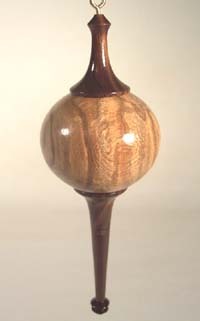 It has been finished with multiple coats of lacquer. 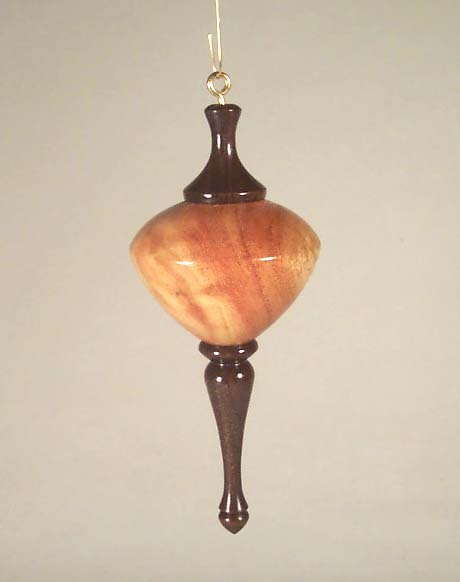 This is a fairly large and attractive ornament with a flattened-oval Texas Honey Mesquite globe. This type of Mesquite is fairly novel in that it is known as "Mistletoe Mesquite" - a portion of a Mesquite limb that once hosted a large clump of Mistletoe. The "roots" of the Mistletoe plant penetrated the bark, sapwood and the outer heartwood to produce those darker brown vertical lines and unusual grain pattern. 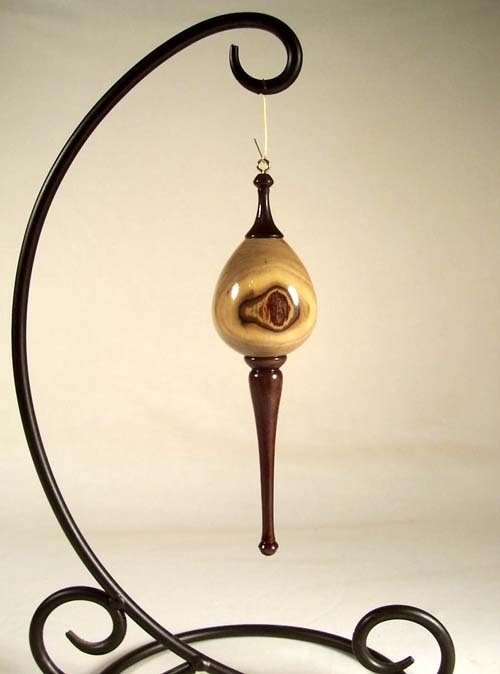 The globe has been hollowed to produce a fairly light-weight ornament. The icicle and capping finial were turned from Texas Honey Mesquite heartwood. This ornament is 6-3/4" tall and 2-1/2" wide. It was sanded to 1000 grit and finished with multiple coats of lacquer. I believe that it turned out to be very attractive. 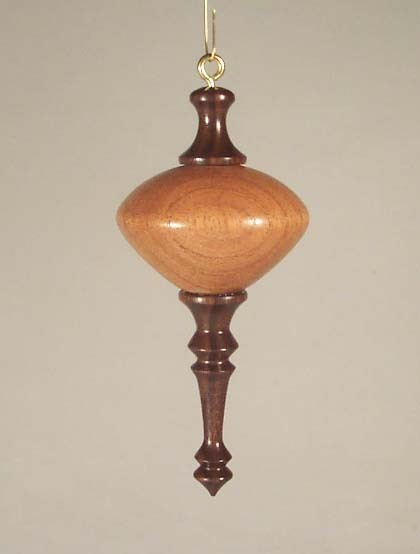 This is another fairly large and very attractive ornament with a crown-shaped globe turned from our Texas Live Oak. 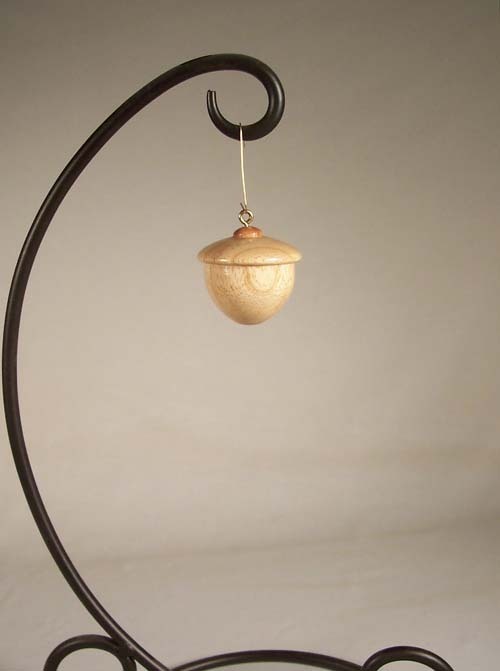 The globe has also been hollowed to produce a fairly light-weight ornament that will not rest too heavily on your Christmas tree. 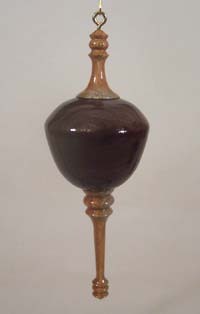 The icicle and capping finial were turned from very dark brown Texas Ebony heartwood, terminated in smaller crown-like knobs. This ornament is about 7-1/2" tall and 2-1/2" wide. 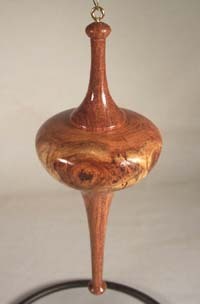 It was sanded to 1000 grit and finished with multiple coats of lacquer. 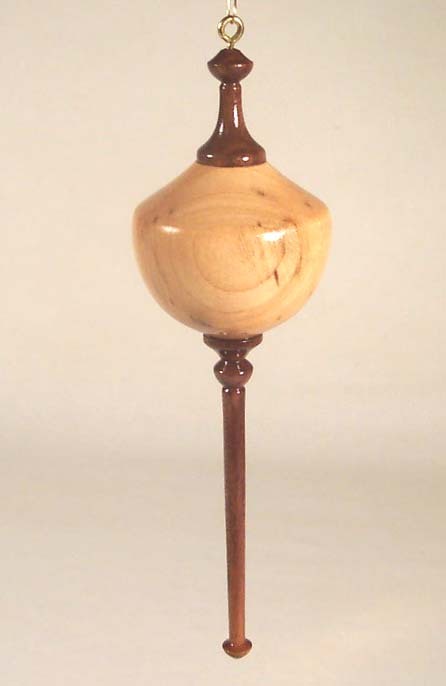 This is smaller but very attractive ornament with a crown-shaped globe turned from spalted Texas Ebony. 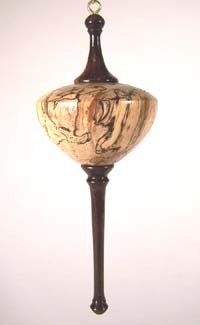 Note - spalting is a very early stage of wood decay in the still-live tree where the wood develops unusual colors and frequently very attractive patterns. 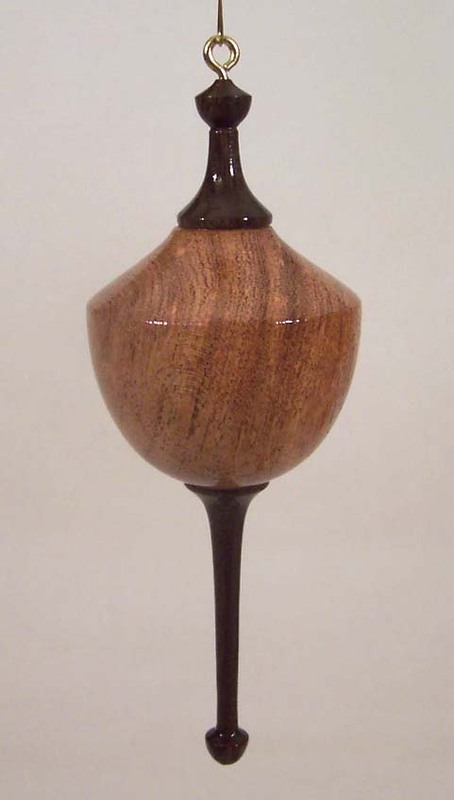 Spalting in our Texas Ebony trees is generally very attractive and this is no exception. 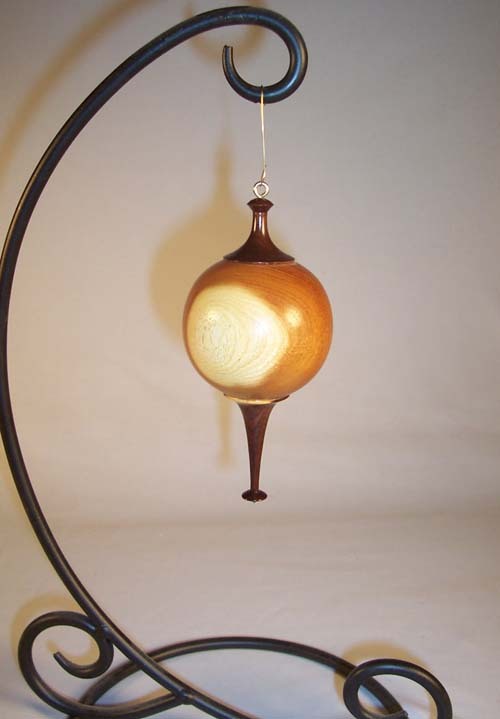 The globe has also been hollowed to produce a very light-weight ornament that will not rest too heavily on your Christmas tree. The icicle and capping finial were turned from the light brown wood of our Mexican Plum and are also terminated in smaller crown-like knobs. 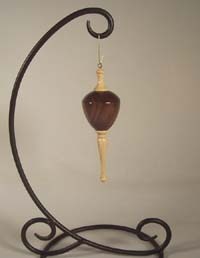 This ornament is about 5-1/2" tall and 1-3/4" wide. It was sanded to 1000 grit and finished with multiple coats of lacquer. 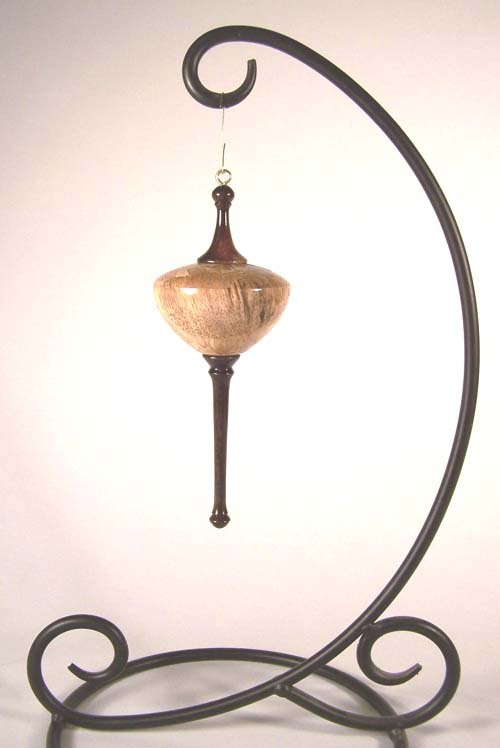 This is another fairly large and very attractive ornament with a top-shaped globe turned from our Texas Live Oak. The globe has also been hollowed to produce an ornament that is very light-weight for its size. It also "turned-out" to be very pretty. 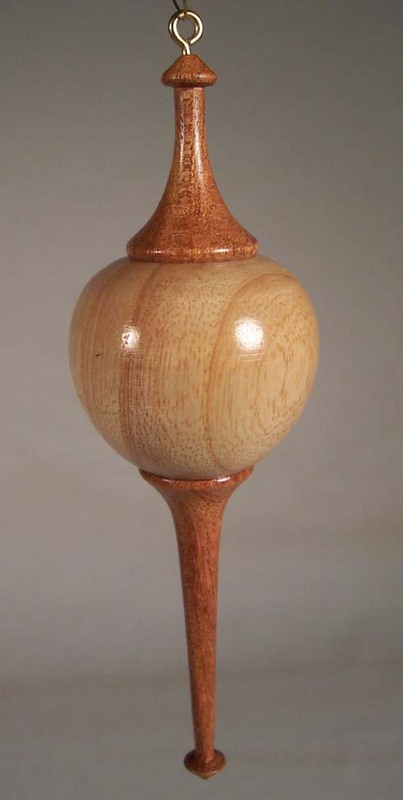 The icicle and capping finial were turned from a strongly-grained Post Oak (I really like that grain pattern). This ornament is about 6-1/2" tall and 2-1/2" wide. It was sanded to 1000 grit and finished with multiple coats of lacquer. This is a very nice, medium-size, ball-type ornament turned in our local Texas Ash and Mesquite. 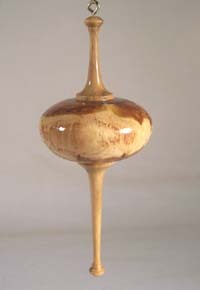 The color of the round globe is the light-brown of Texas Ash; that delicate icicle and capping finial are the very reddish-brown color of our Honey Mesquite. 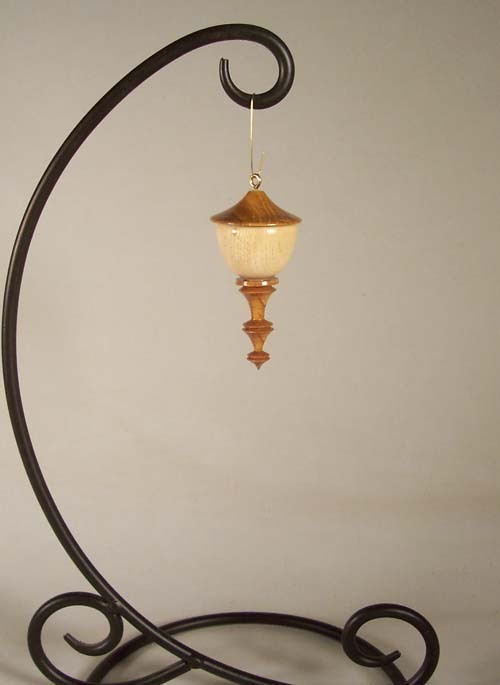 The globe has also been hollowed to produce a very lightweight ornament. This ornament is approximately 5-3/4" tall and 1-3/4" wide. 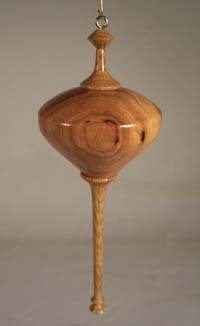 It was sanded to 1000 grit and finished with multiple coats of lacquer. 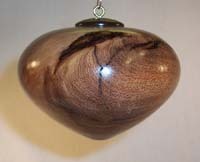 This is another very nice, medium-size, ball-type ornament turned in beautiful spalted Texas Ebony and Live Oak. 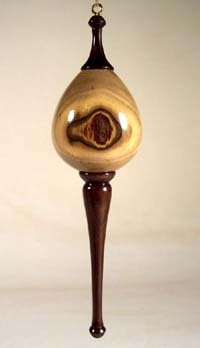 The color of the round globe is a golden-brown with numerous and occasionally-irregular stripes and bands of dark brown; that delicate icicle and capping finial are the light-brown color of Live Oak. Both the icicle and finial are terminated in ball-forms which mimic the larger globe. The globe was also hollowed to produce a very lightweight ornament. 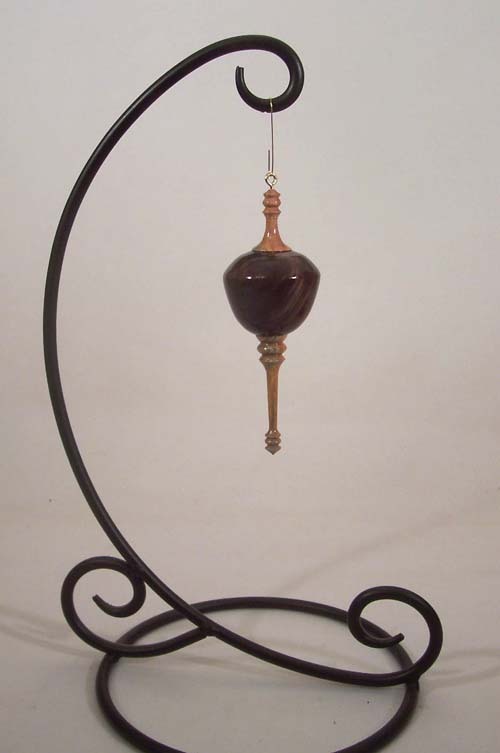 This ornament is approximately 5" tall and 1-3/4" wide. 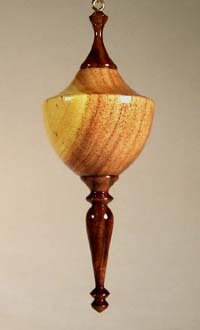 It was sanded to 1000 grit and finished with multiple coats of lacquer. This is another fairly small but very attractive ornament with a crown-shaped globe turned from spalted Texas Ebony. Spalting in our Texas Ebony trees is generally very attractive and this is no exception. 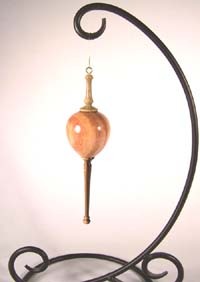 The globe has also been hollowed to produce a very light-weight ornament that will not rest too heavily on your Christmas tree. 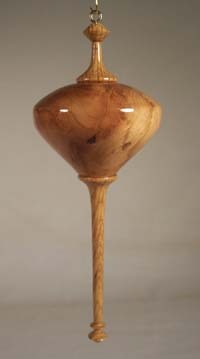 The icicle and capping finial were turned from the light brown wood of local Live Oak and are also terminated in smaller crown-like knobs. This ornament is about 4-1/2" tall and 1-3/4" wide. 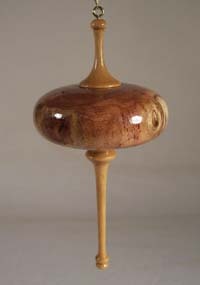 It was sanded to 1000 grit and finished with multiple coats of lacquer. 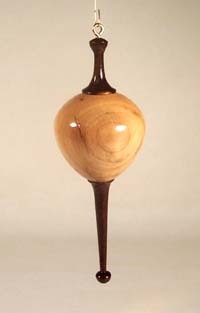 This is another fairly small but very attractive ornament with an oval globe turned from spalted Texas Ebony. The icicle and capping finial were turned from dark brown, non-spalted Texas Ebony heartwood. 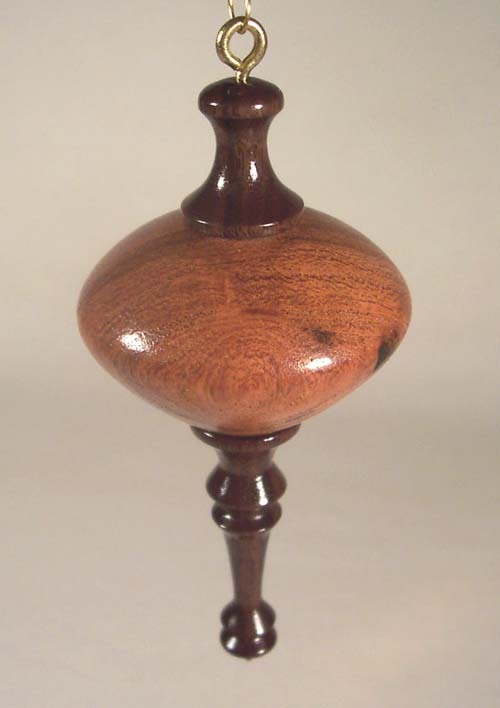 There is a small spot of bright yellow sapwood on one edge of the finial. 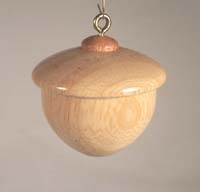 The globe has also been hollowed to produce a very light-weight ornament that will not rest too heavily on your Christmas tree. It was sanded to 1000 grit and finished with multiple coats of lacquer. The overall height is about 6"; the width is approximately 1-7/8". This is another fairly small but very attractive ornament with a crown-shaped globe turned from Texas Huisache (pronounced "wee-sach"....aka "Sweet Acacia"). The icicle and capping finial were also turned from Huisache and are terminated in smaller crown-like knobs. 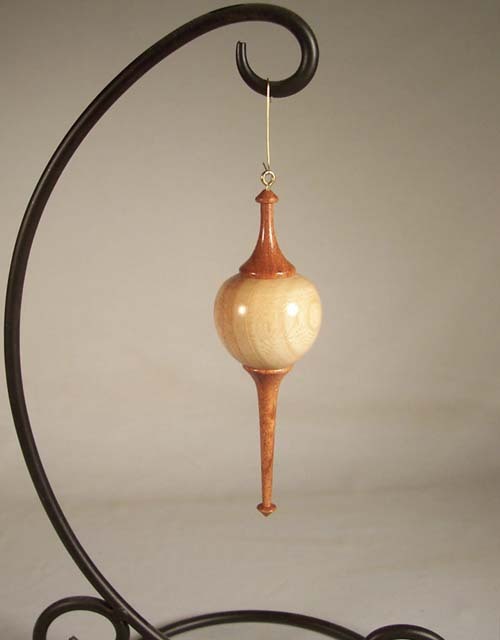 The globe has been hollowed to produce a very light-weight ornament. It was sanded to 1000 grit and finished with multiple coats of lacquer. 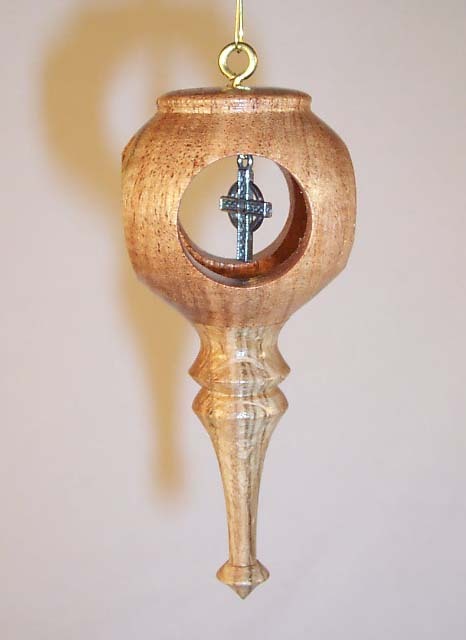 It is 5" tall and 1-3/4" wide. This is a small but attractive, acorn-shaped ornament turned from Texas Ash. The color is the light brown of Texas Ash with a small knob of Honey Mesquite at the top (to which the brass screw-eye is attached). The globe has also been hollowed to make it a very light-weight ornament. 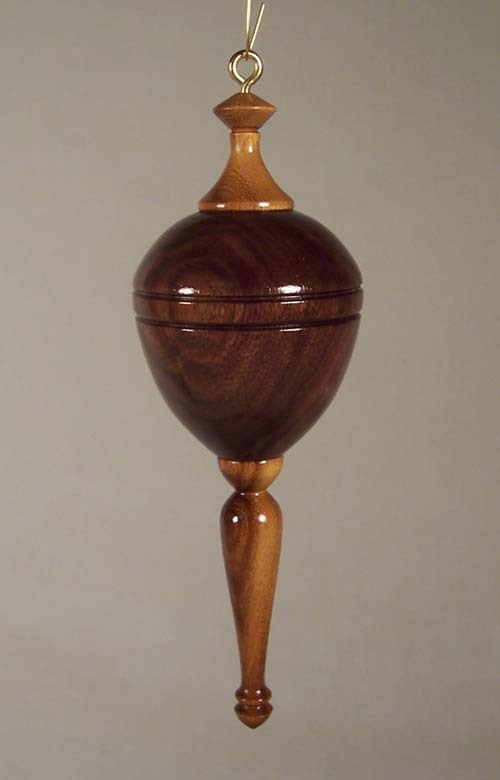 It is 1-1/2" tall and 1-3/4" wide, and has been well sanded and finished with multiple coats of lacquer. 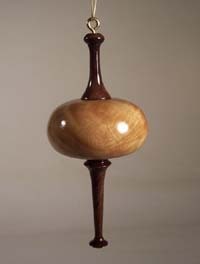 This is a very attractive ornament with a top-shaped globe turned from very dark, spalted Texas Ebony. 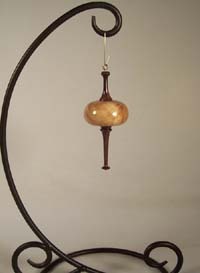 The globe has also been hollowed to produce a very light-weight ornament. 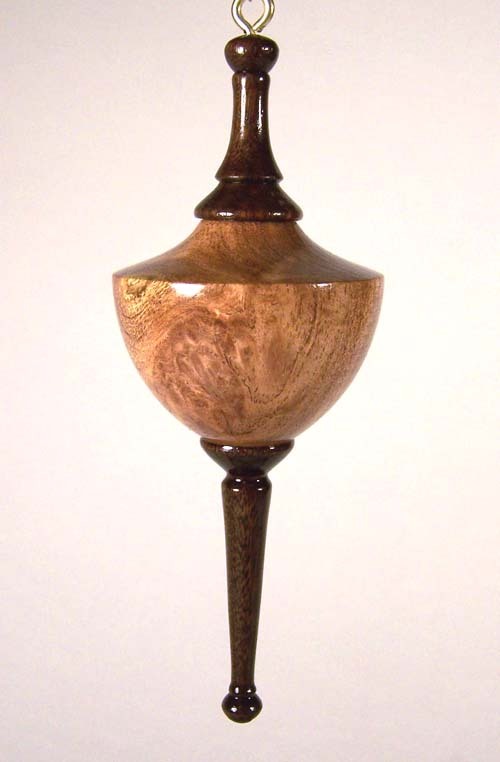 The icicle and capping finial were turned from the light brown wood of our Texas Live Oak. 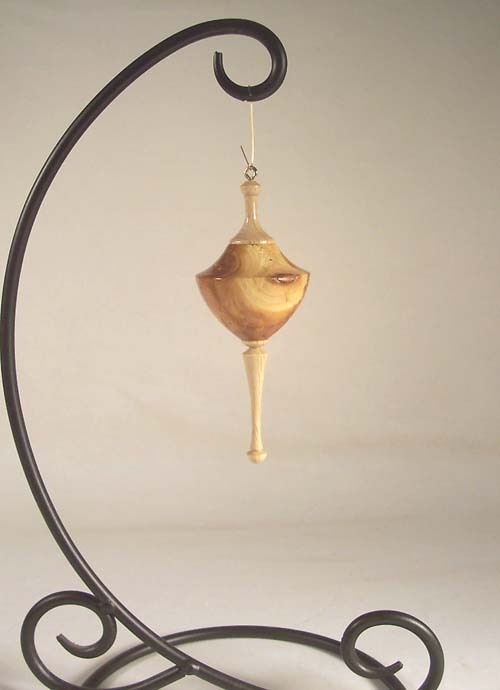 This ornament is about 5-1/2" tall and 1-3/4" wide. It was well sanded and finished with multiple coats of lacquer. 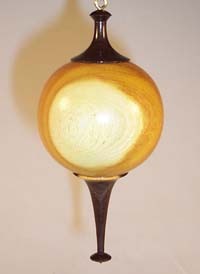 This is another fairly small but very attractive ornament with a flattened-oval globe. That globe was turned from Texas Huisache (pronounced "wee-sach"....aka "Sweet Acacia") and hollowed to produce a very light-weight ornament. The icicle and capping finial were turned from very dark brown-black Texas Ebony and are terminated in tight, angular rings. 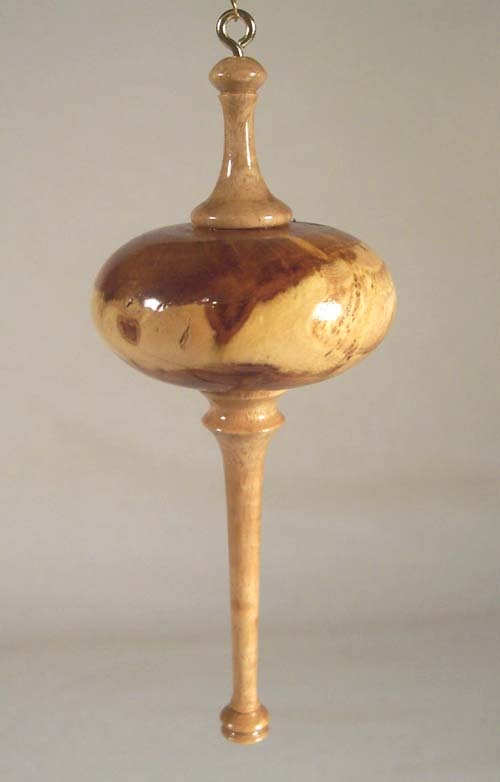 It is 4-1/2" tall and 1-3/4" wide, and was well sanded and finished with multiple coats of lacquer. 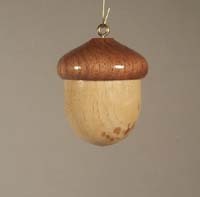 This is a small ornament with an acorn-shaped globe turned from Texas Pecan and with a finial and icicle turned from Texas Bodark (Osage Orange). 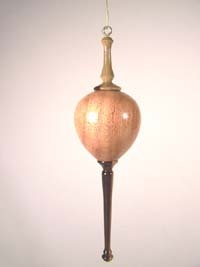 The globe is soft, light-brown color; the icicle and capping finial are a pleasant orange color. On a whim I turned the finial to look a bit like a conical Asian hat and the icicle to include several tight, angular rings. The height is 3-1/4" and the width is just over 1-1/2". It has been well sanded and finished with multiple coats of lacquer. 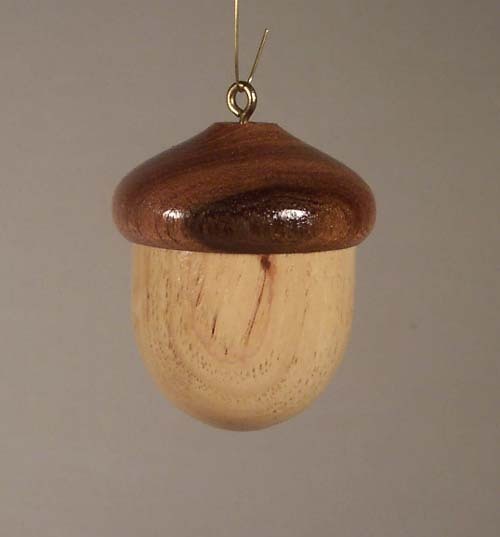 This is a small but attractive, acorn-shaped ornament turned from Texas Pecan. The color is the light brown of Pecan with a cap turned from the rose-tinted light-brown of Texas Huisache (aka Sweet Acacia). 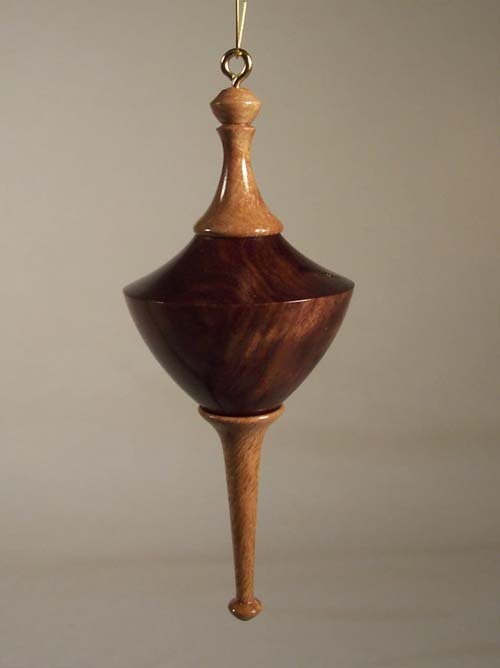 It is approximately 2" tall and 2" wide, and has been well sanded and finished with multiple coats of lacquer. 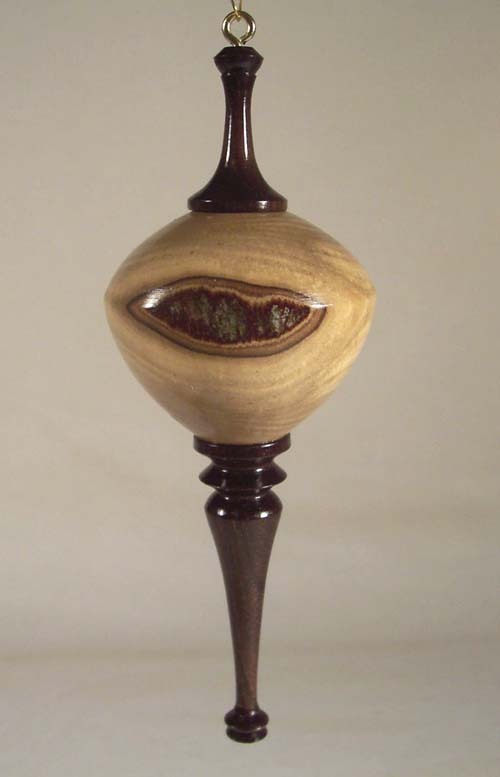 This is a beautiful ornament with a top-shaped globe turned from very dark, spalted Texas Ebony. The icicle and capping finial were turned from a lighter colored, honey-brown piece of Texas Ebony. I also included two crisp grooves around the upper half of the globe. 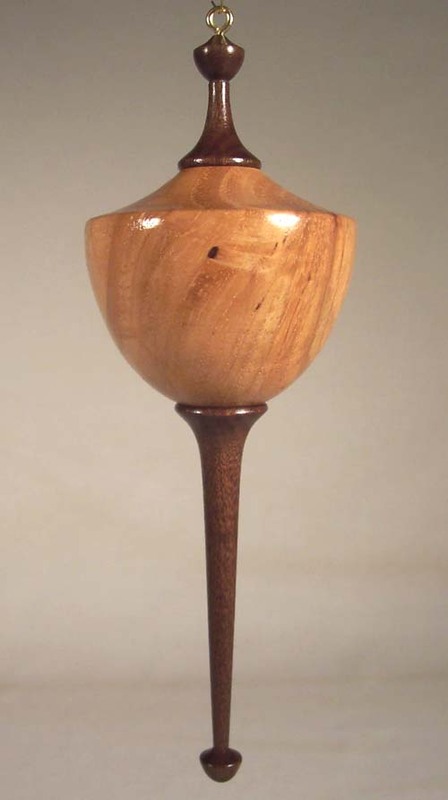 The overall size is approximately 5" tall and 1-1/2" wide. 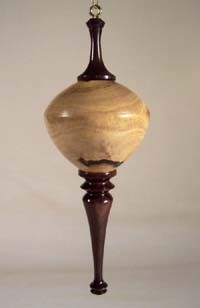 The globe was also hollowed to produce a very light-weight ornament, and then well sanded and finished with multiple coats of lacquer. 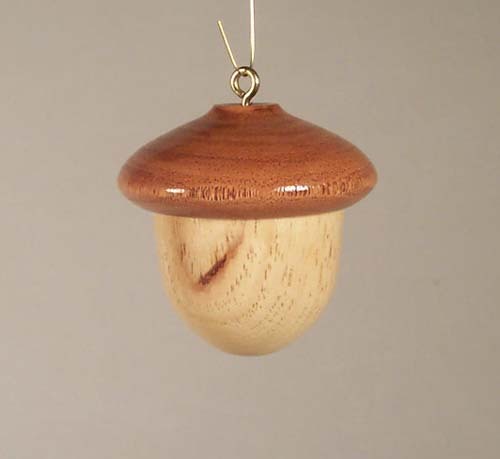 This is another small but attractive, acorn-shaped ornament turned from Texas Pecan. 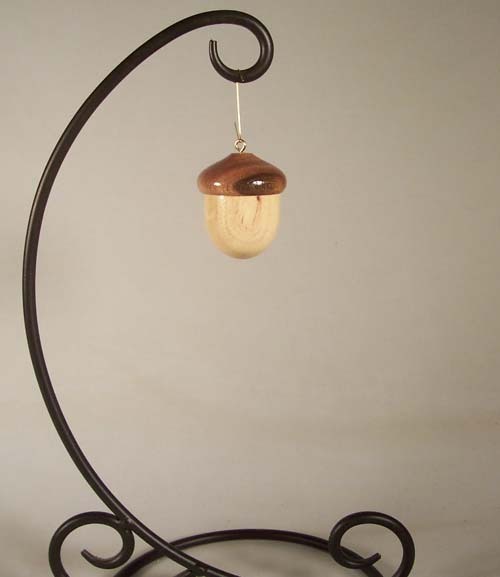 The color is the light brown of Pecan with a cap turned from the rich reddish-brown of our Texas Honey Mesquite. It is approximately 2" tall and 2" wide, and has been well sanded and finished with multiple coats of lacquer. This is another very attractive ornament with a rosy-reddish globe turned from Texas Huisache (pronounced "wee-sach"....aka "Sweet Acacia"). 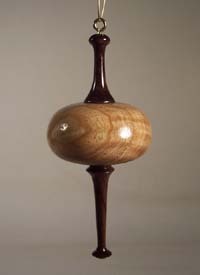 The icicle and capping finial were turned from spalted brown and black colored Texas Ebony. 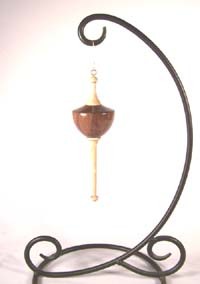 It is 5" tall and 1-5/8" wide. 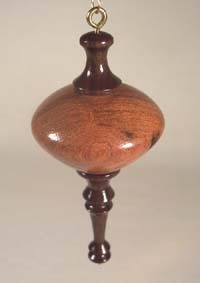 The globe was also hollowed to produce a very light-weight ornament, and was well sanded and finished with multiple coats of lacquer. 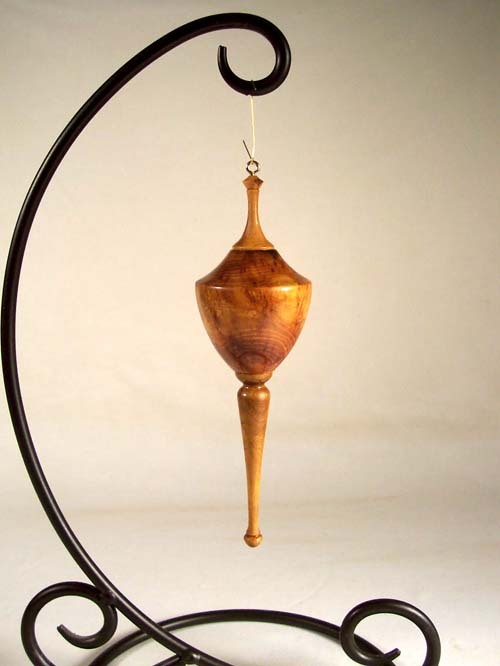 This is a beautiful ornament with a top-shaped globe turned from very dark, spalted Texas Ebony. 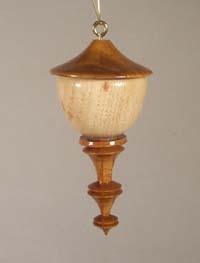 The icicle and capping finial were turned from a very light-colored piece of Texas Live Oak. The overall size is approximately 5-3/4" tall and 1-7/8" wide. 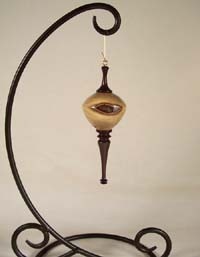 The globe was also hollowed to produce a very light-weight ornament, and then well sanded and finished with multiple coats of lacquer. 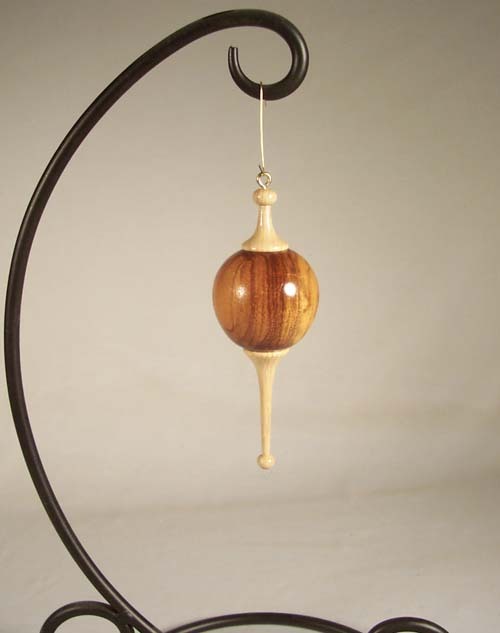 This is a very pretty ornament turned in light-brown curly Texas Ash with a dark brown, almost black Texas Ebony finial and icicle. 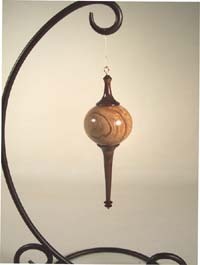 The globe has also been hollowed to produce a very lightweight ornament. 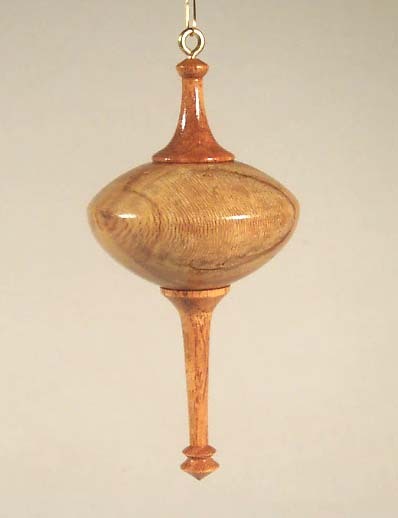 This ornament is approximately 4-1/4" tall and 2" wide. It was sanded to 1000 grit and finished with multiple coats of lacquer. 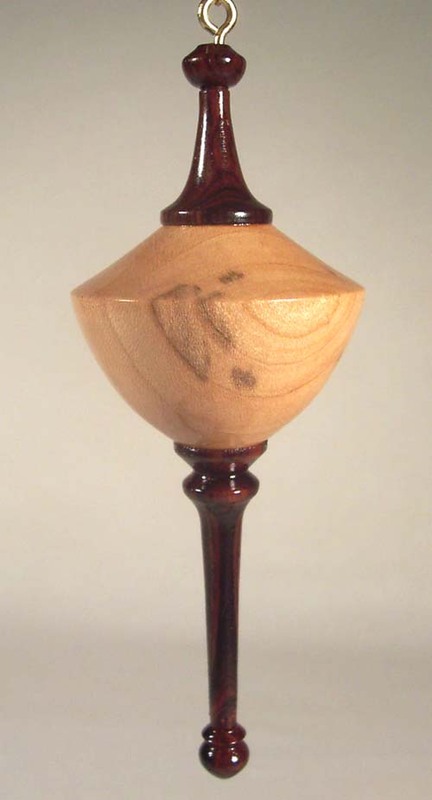 This is a very pretty ornament with a crown-shaped globe turned from very dark, spalted Texas Ebony. 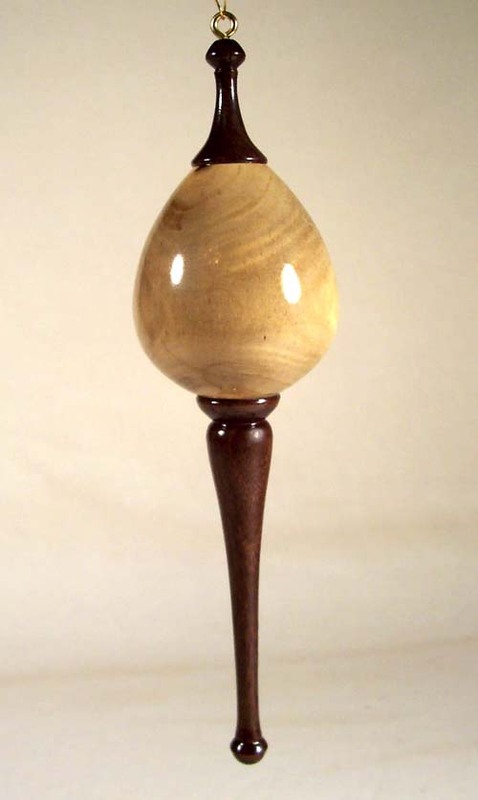 The icicle and capping finial were turned from light-brown Texas Live Oak. 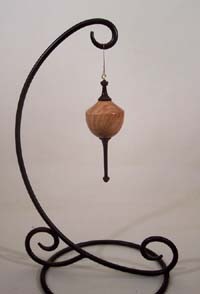 The overall size is approximately 4-1/2" tall and 1-3/4" wide. The globe was also hollowed to produce a very light-weight ornament, and then well sanded and finished with multiple coats of lacquer. This is another very pretty ornament turned in light-brown curly Texas Ash with a dark brown, almost black Texas Ebony finial and icicle. 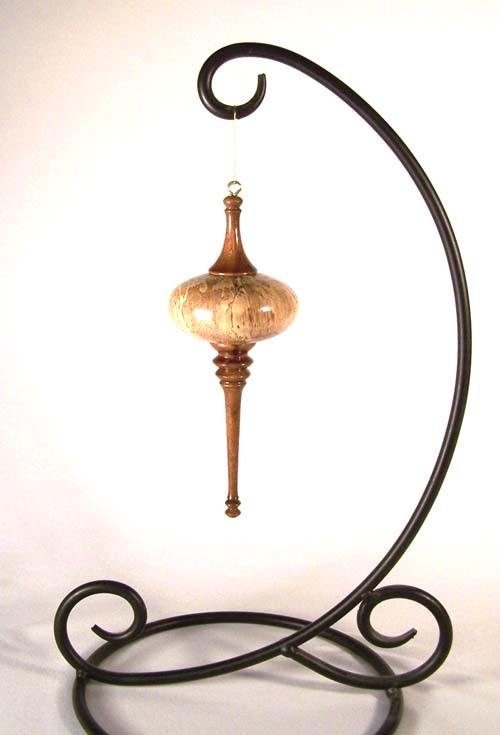 That crown-shaped globe has been hollowed to produce a very lightweight ornament. 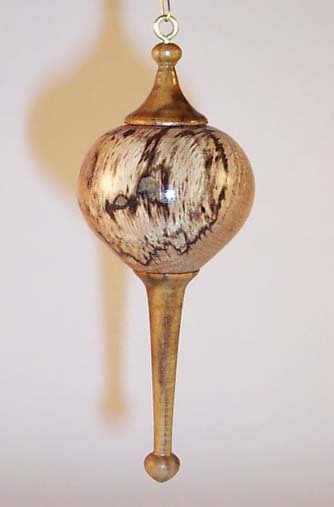 This ornament is approximately 4" tall and 2" wide. 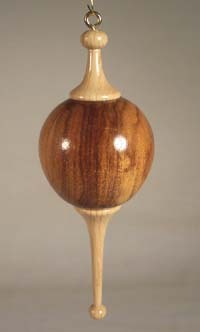 It was sanded to 1000 grit and finished with multiple coats of lacquer. 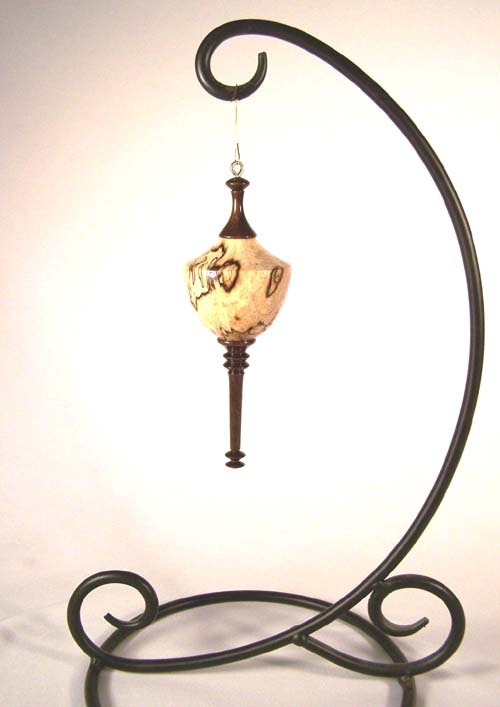 This is a medium size but very attractive ornament with a flattened-oval globe. 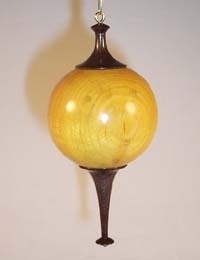 That globe was turned from Texas Bodark (that is Bois d'Arc or Osage Orange for you non-Texas folks). 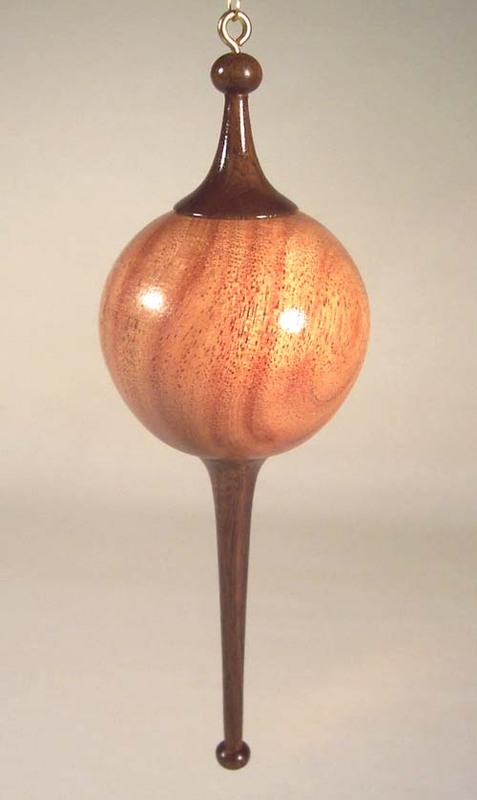 The orange color is typical of Bodark heartwood and will darken to an even more beautiful golden brown with age. 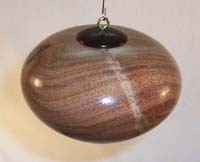 The creamy-light brown color is typical of Bodark sapwood. That small bark gap on one side (left side, middle photo) and a small, open crack (just beyond the bark gap in the middle photo) are natural features in the wood present before turning and were left in this ornament as eye-catching "character features". 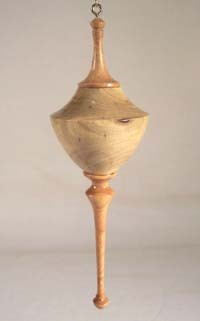 The icicle and capping finial were turned from light brown Texas Ash. It is 5" tall and 2" wide. 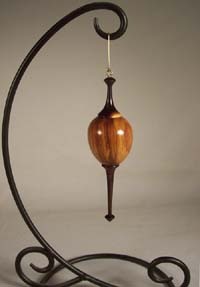 It was hollowed to result in a very light weight, and finished with multiple coats of lacquer. 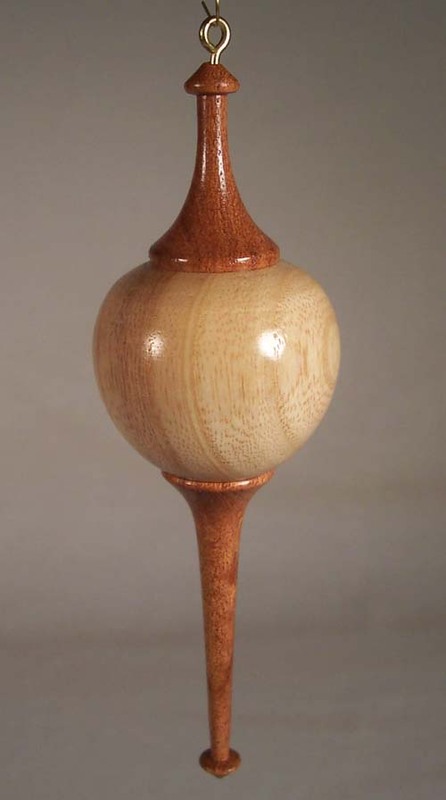 This is a very attractive ornament with a top-shaped globe turned from Texas Honey Mesquite. This type of Mesquite is fairly novel in that it is known as "Mistletoe Mesquite" - a portion of a Mesquite limb that once hosted a large clump of Mistletoe. The "roots" of the Mistletoe plant penetrated the bark, sapwood and the outer heartwood to produce dark brown vertical lines and an unusual grain pattern. 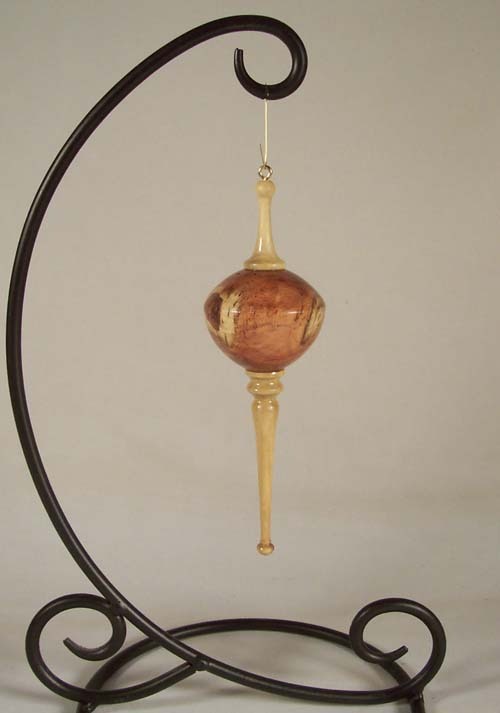 The globe has also been hollowed to produce a very light-weight ornament. 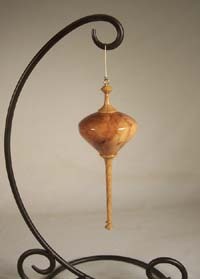 The icicle and capping finial were turned from the light brown wood of our native Texas Persimmon tree. This ornament is about 7" tall and 2-1/4" wide. 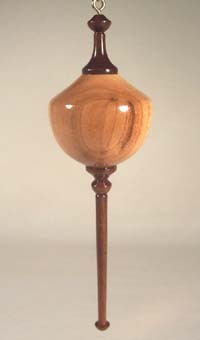 It was well sanded and finished with multiple coats of lacquer. This is a beautiful ornament with a top-shaped globe turned from a nicely-figured piece of Texas Persimmon. An elongated patch of bark was left on one side that resembles a single "eye". A small, irregular, black patch of imbedded bark is present on the lower portion of the globe (bottom photo). 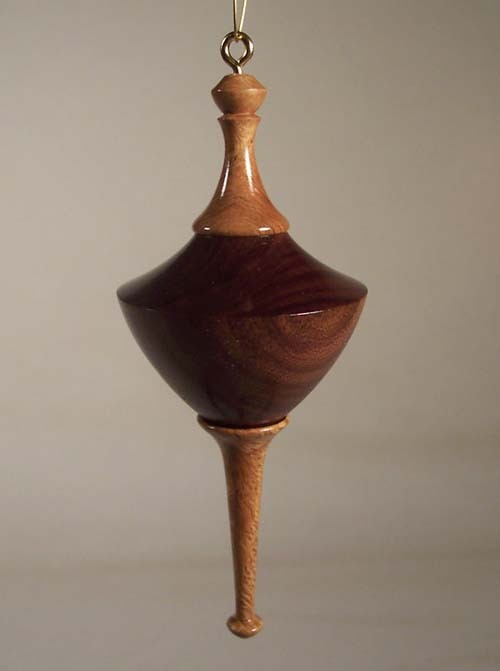 The icicle and capping finial were turned from very dark brown Texas Ebony heartwood. 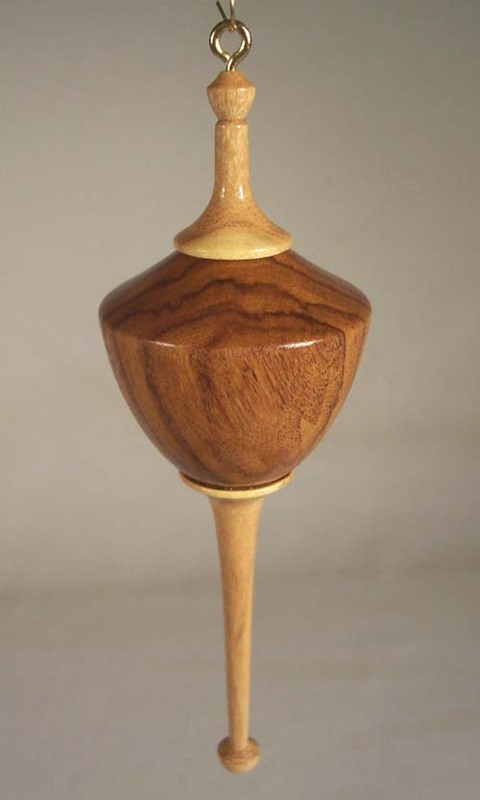 The overall size is approximately 5-1/2" tall and 2" wide. 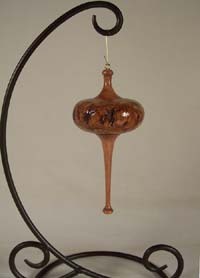 The globe was also hollowed to produce a very light-weight ornament, and then well sanded and finished with multiple coats of lacquer. 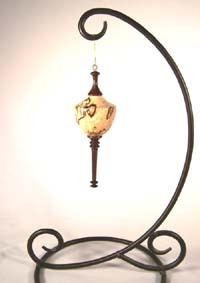 This is a medium size but very attractive ornament with a flattened-oval globe. 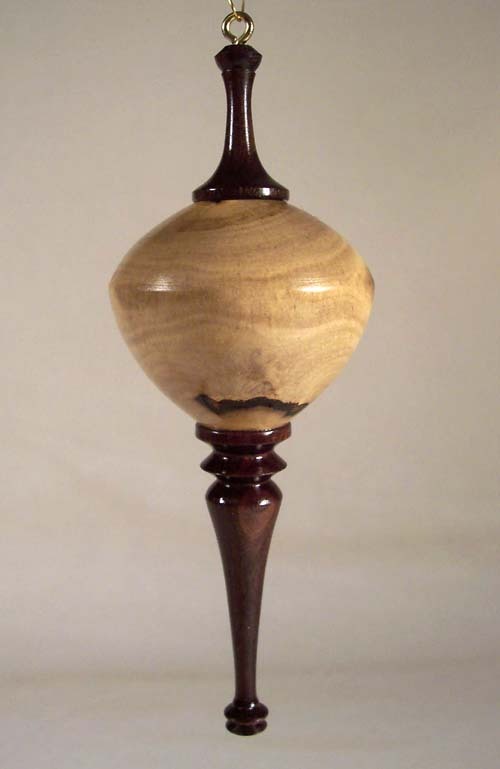 That globe was turned from Texas Bodark (Bois d'Arc or Osage Orange for you non-Texas folks). 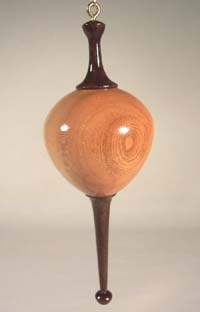 That beautiful orange color is typical of Bodark heartwood and will darken to an even more beautiful golden brown with age. 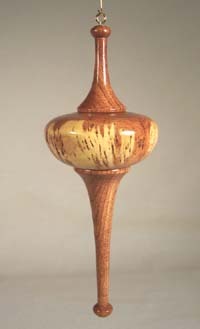 The creamy-light brown color is typical of Bodark sapwood. 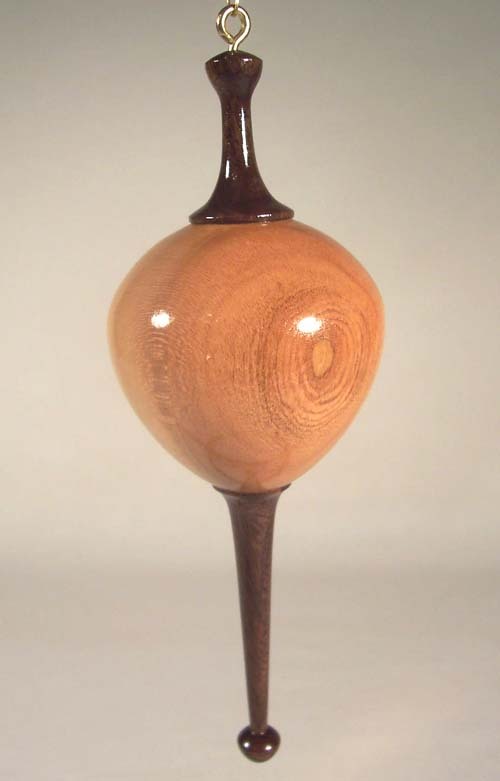 That small open crack (middle photo) is a natural feature in the wood present before turning and were left in this ornament as an eye-catching "character feature". 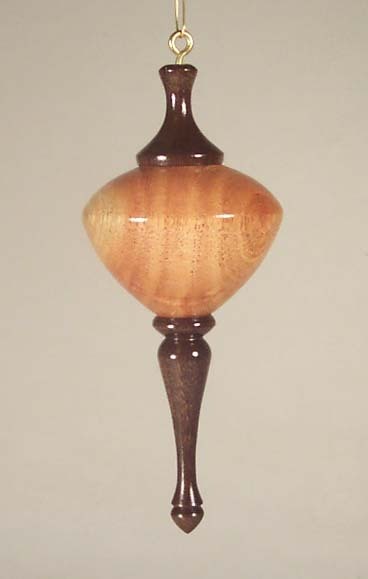 The icicle and capping finial were turned from light brown sapwood of Texas Ebony. 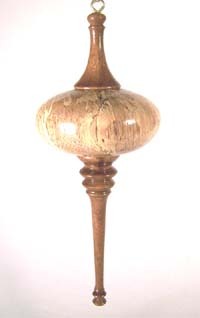 It is approximately 5-1/2" tall and 2-1/4" wide. 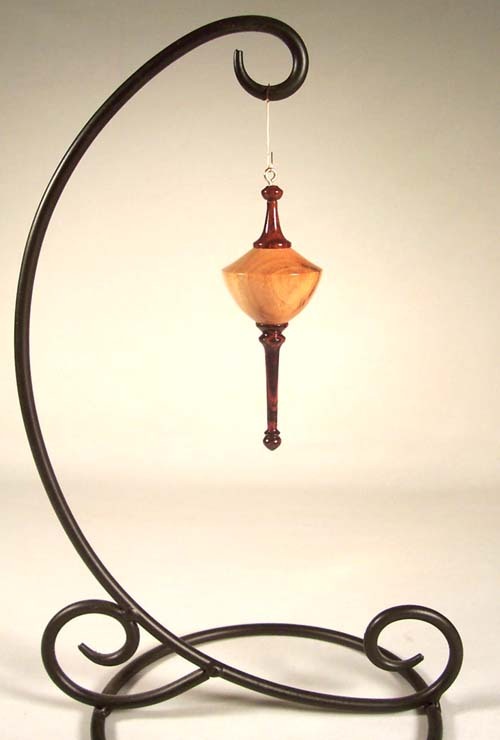 It was hollowed to result in a very light weight, and finished with multiple coats of lacquer. 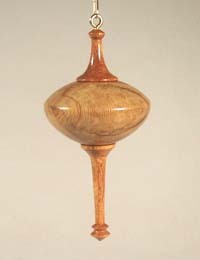 This is another fairly large and very attractive ornament with a flattened-oval Texas Honey Mesquite globe. This type of Mesquite is fairly novel in that it is known as "Mistletoe Mesquite" - a portion of a Mesquite limb that once hosted a large clump of Mistletoe. The "roots" of the Mistletoe plant penetrated the bark, sapwood and the outer heartwood to produce those darker brown vertical lines and unusual grain pattern. A large section of creamy brown sapwood and dark brown fissured bark on one side add to the unique beauty. 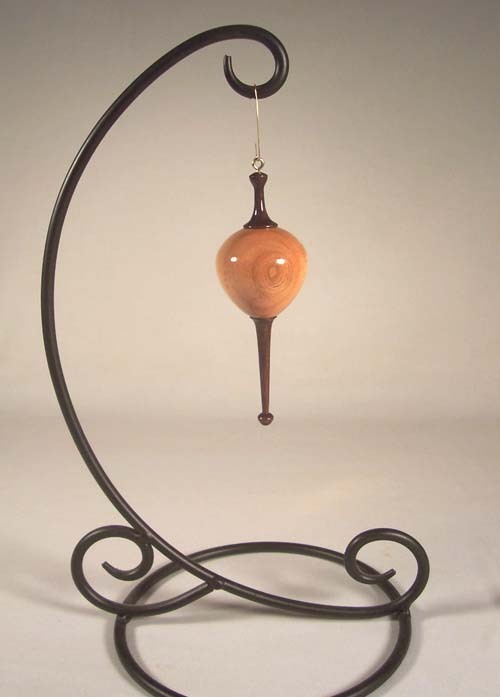 The globe has been hollowed to produce a fairly light-weight ornament. The icicle and capping finial were turned from light brown Texas Honey Mesquite sapwood. This ornament is 6" tall and 3" wide. 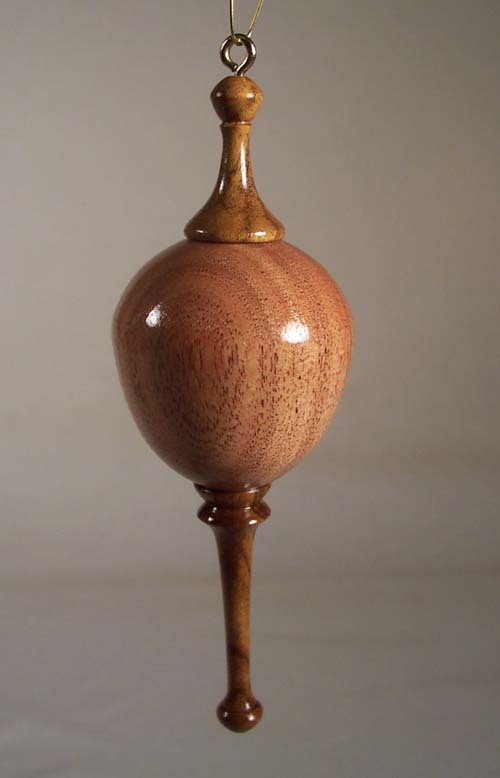 It was sanded to 1000 grit and finished with multiple coats of lacquer. This is another beautiful ornament with a crown-shaped globe turned from a nicely-figured piece of Texas Persimmon. A small, irregular, black patch of imbedded bark forms an eye-catching figure on one side of the globe (bottom photo). A small knot and associated small crack are present in the upper face of the "crown", above the patch of "included bark" (top and middle photo). That small knot and crack are natural features in the wood present before turning and were also left in this ornament as eye-catching "character features". 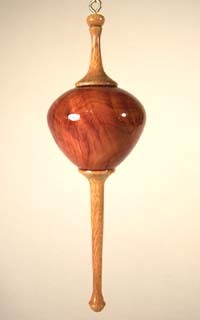 The icicle and capping finial were turned from light brown Texas Ash heartwood. 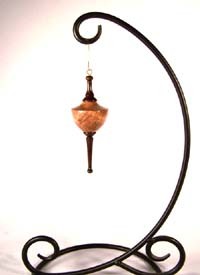 The overall size is approximately 6-3/4" tall and 2" wide. 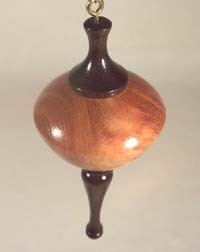 The globe was also hollowed to produce a very light-weight ornament, and then well sanded and finished with multiple coats of lacquer. This is another pretty ornament turned in spalted Texas Bodark with a light brown, Black Cherry finial and icicle. 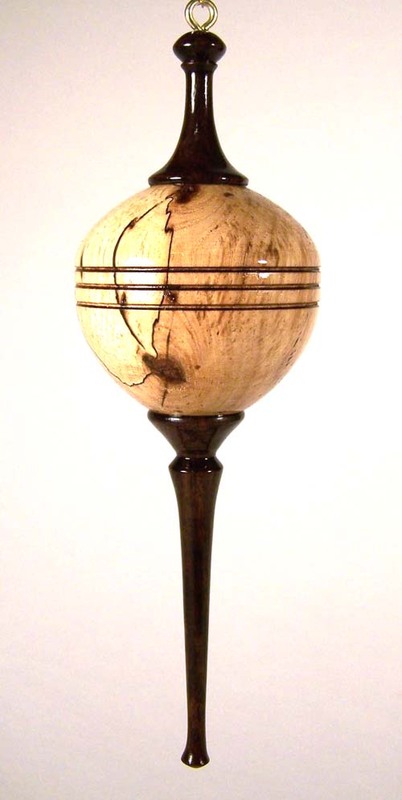 That crown-shaped Bodark globe includes several small eye-catching fissures that were natural features in the wood. I think it looks very attractive. 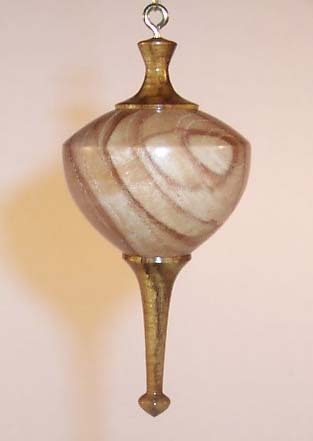 This ornament is approximately 6" tall and 2-1/4" wide. 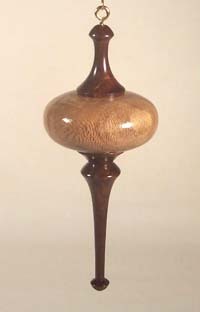 It has been hollowed to produce a very lightweight ornament, and was sanded to 1000 grit and finished with multiple coats of lacquer. The icicle and capping finial were turned from light brown Texas Honey Mesquite sapwood. This ornament is 6-1/2" tall and 3" wide. 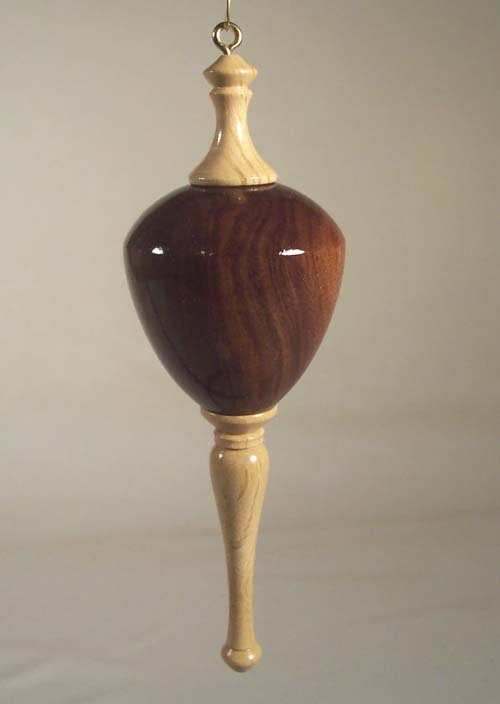 It was sanded to 1000 grit and finished with multiple coats of lacquer. This is another beautiful Texas Persimmon ornament, this time with a teardrop-shaped globe. The gently sweeping grain pattern is very attractive and that elongated patch of bark makes an interesting and eye-catching feature. 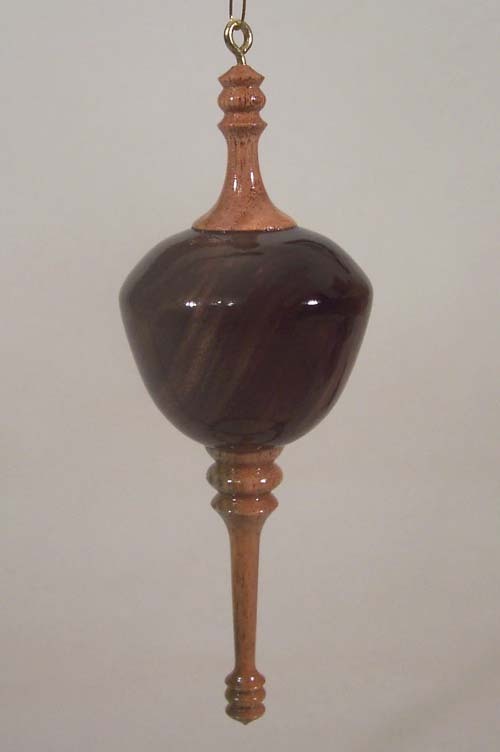 The icicle and capping finial were turned from very dark brown Texas Ebony heartwood. 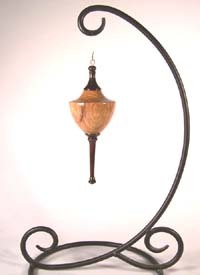 The overall size is approximately 7" tall and 1-3/4" wide. 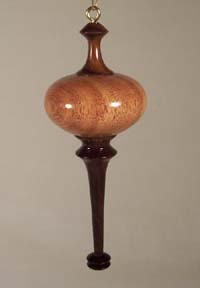 The globe was also hollowed to produce a very light-weight ornament, and then well sanded and finished with multiple coats of lacquer. This is another pretty ornament turned in well-figured, spalted Texas Bodark with a matching finial and icicle. That deep, crown-shaped Bodark globe includes several small eye-catching fissures that were natural features in the wood. I think it looks very attractive. 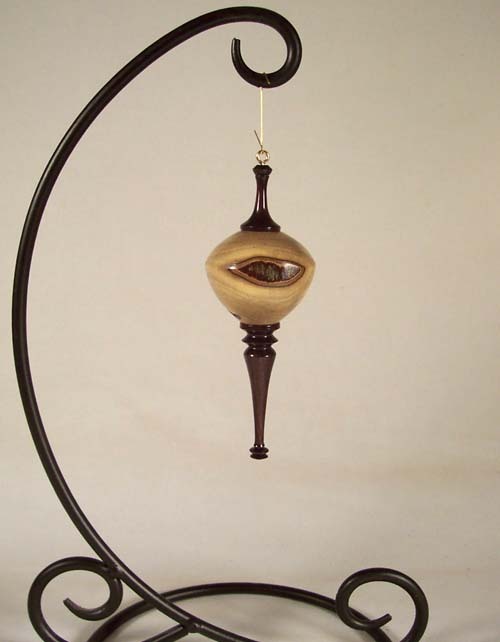 This ornament is approximately 7" tall and 2" wide. It has been hollowed to produce a very lightweight ornament, and was sanded to 1000 grit and finished with multiple coats of lacquer. This is another beautiful ornament turned in Texas Persimmon. 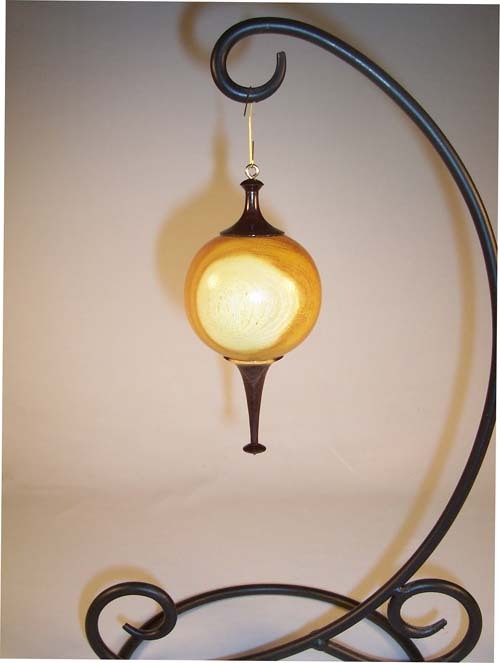 The globe in this one is is a low-profile oval-shape with a gently sweeping and very attractive grain pattern. Again, I left an elongated patch of Persimmon bark on a portion of the edge to make an interesting and eye-catching feature. 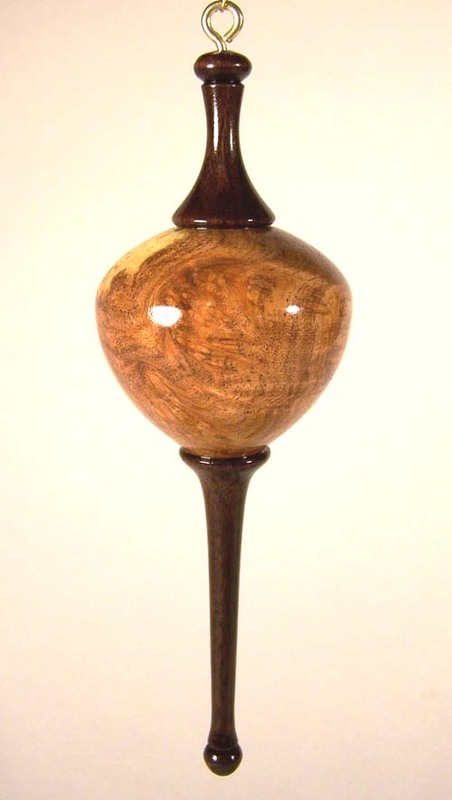 The capping finial and complex icicle were turned from very dark brown Texas Ebony heartwood. The overall size is approximately 5" tall and 2" wide. 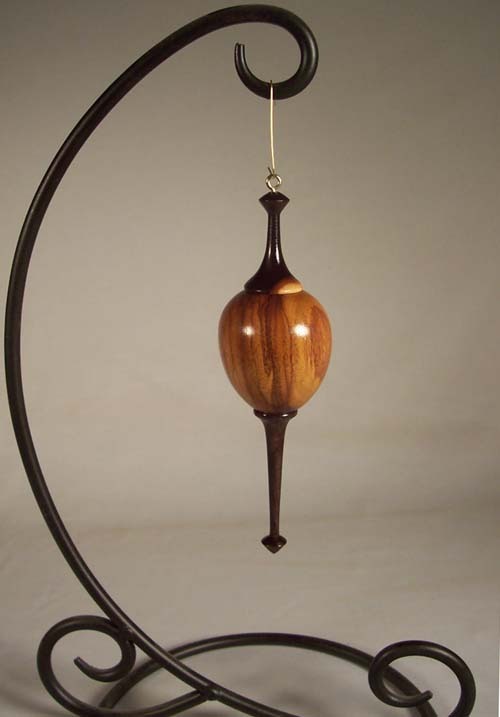 The globe was also hollowed to produce a very light-weight ornament, and then well sanded and finished with multiple coats of lacquer. 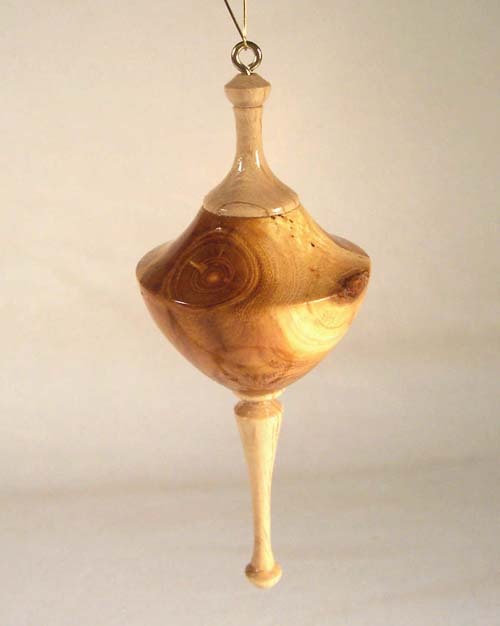 This is another pretty spalted Texas Bodark ornament. 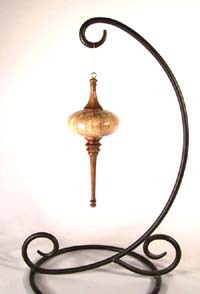 That highly-figured globe was turned with a low profile crown shape. 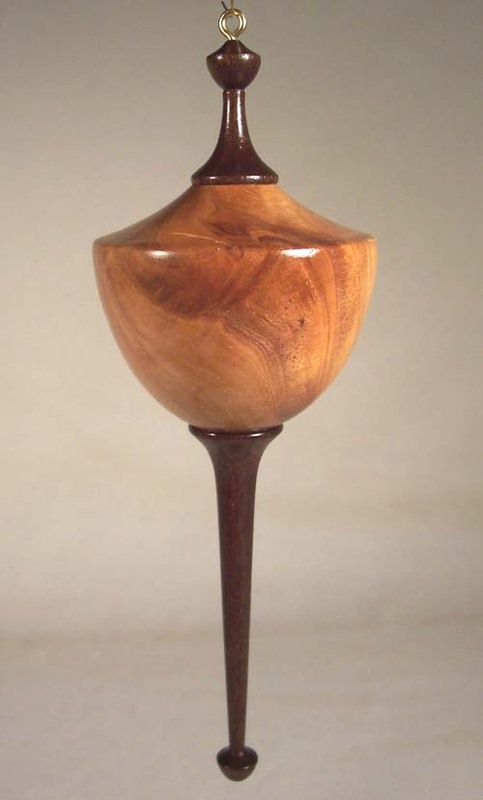 The raw Bodark wood from which it was turned was a small crotch and the central pith of each separate limb of the crotch is visible as a small knot within a circular grain pattern on the upper face of the crown. 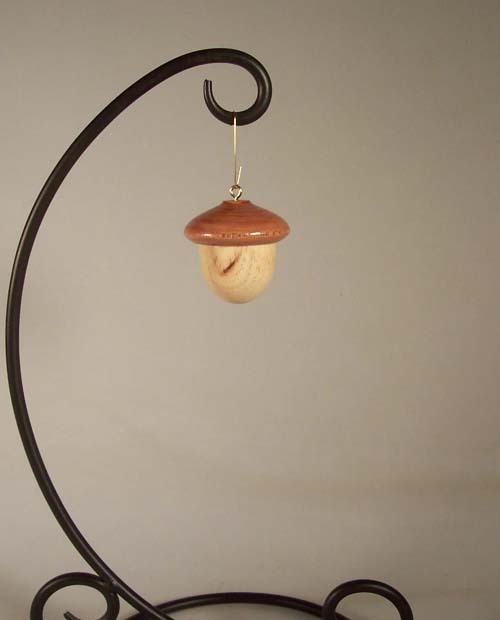 I think they add to the unique nature of this ornament. 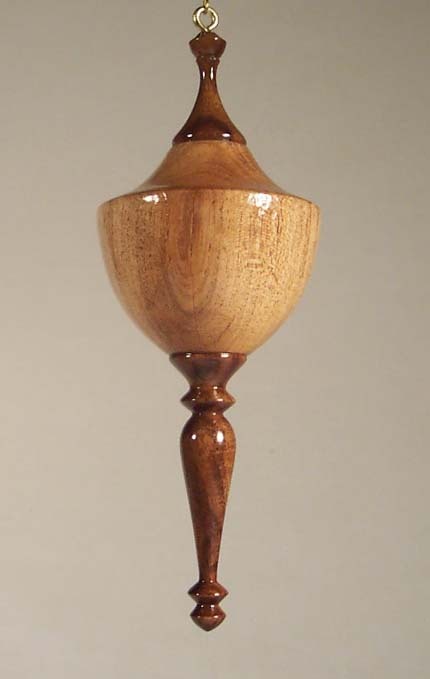 The icicle and capping finial were turned from very light brown Texas Live Oak. This ornament is approximately 5" tall and 2" wide. 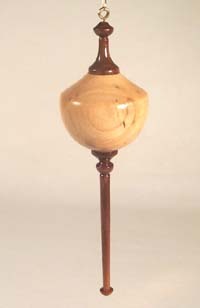 It has also been hollowed to produce a very lightweight ornament, and was sanded to 1000 grit and finished with multiple coats of lacquer. 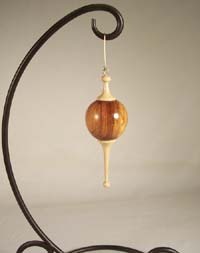 This beautiful small ornament has a globe turned from a very nice piece of classic Texas Honey Mesquite. 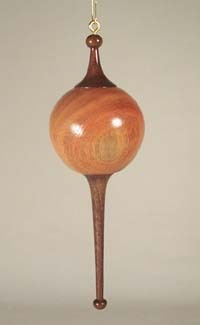 The color of the globe includes the strong reddish-brown of Honey Mesquite heartwood and a section of bright creamy-yellow sapwood. The small capping finial and delicate icicle spindle are turned from our exotic, dark brown Texas Ebony. The globe has been hollowed to achieve an extremely light weight. 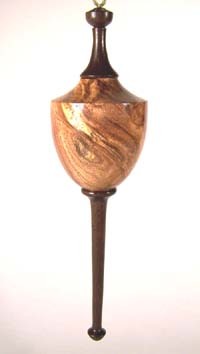 The overall size is just over 5" tall and 2" wide. Finishing included careful sanding and multiple coats of lacquer. This beautiful small ornament has a globe turned from a very nice piece of classic Texas Honey Mesquite. 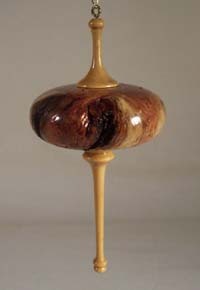 The color of the globe is the strong reddish-brown of Honey Mesquite heartwood. 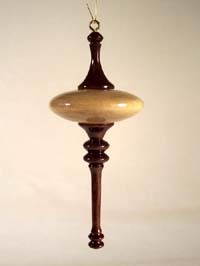 The small capping finial and slender icicle spindle are turned from our exotic, dark brown Texas Ebony found along the Texas-Mexico border. The globe has been hollowed to achieve an extremely light weight. The overall size is 5" tall and just under 2" wide. Finishing included sanding to 1000 grit and multiple coats of lacquer. 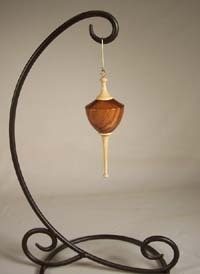 This is a very nice small ornament turned in our exotic Texas Ebony and Huisache (aka - Sweet Acacia, and pronounced "wee-sash"). The color of the globe is the very dark, almost black common in the heartwood of many Texas Ebony trees, with a soft and delicate appearing, lighter brown pattern in the grain (that does not show up well in the photos but is very attractive when viewed in real life). 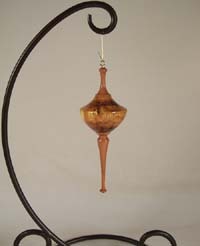 The delicate icicle and the capping finial are the soft orange to rosy-brown color typical of our south Texas Huisache. 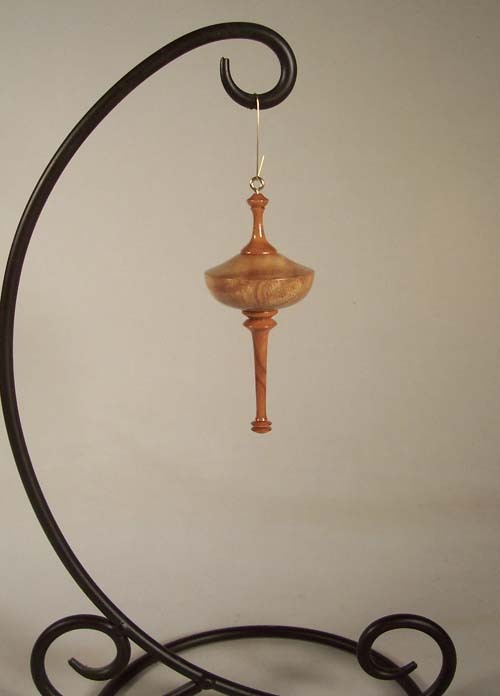 The globe has been hollowed to produce a very lightweight ornament. 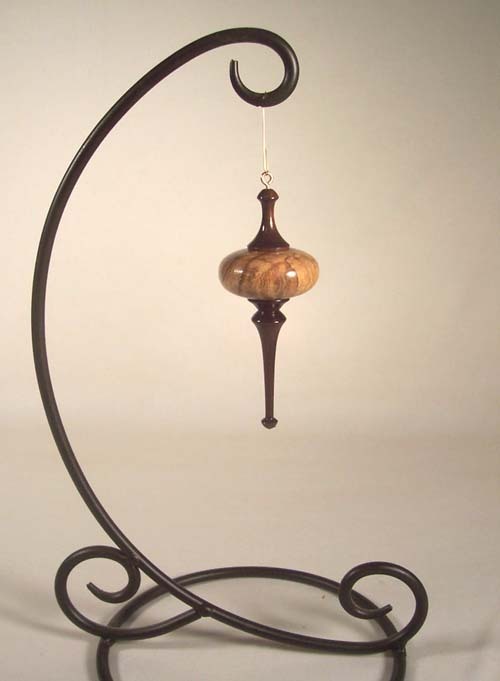 This ornament is approximately 5" tall and just under 2" wide. It was sanded to 1000 grit and finished with multiple coats of lacquer. 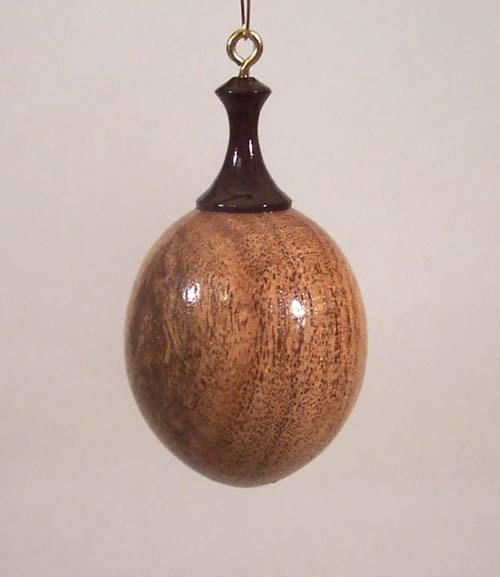 This is a very pretty small egg-shaped ornament in Texas Honey Mesquite and Texas Ebony. 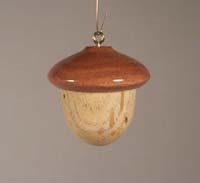 Again, the color of the globe portion is the strong reddish brown of our Texas Mesquite heartwood with a strong, high-angle grain pattern. The finial is very dark brown (almost black) - the color of pure Texas Ebony heartwood. 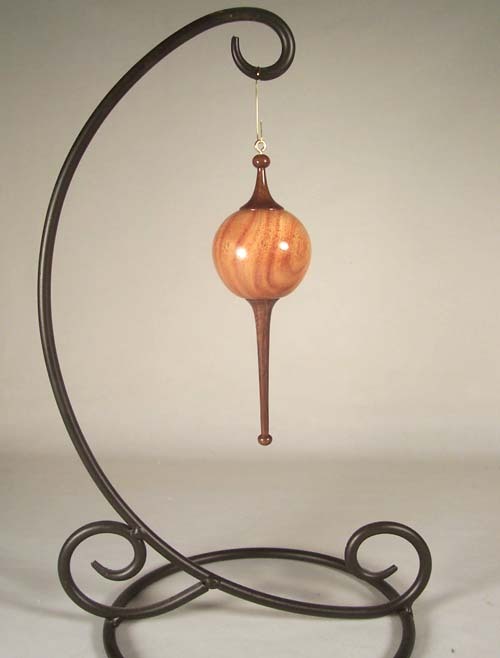 The globe has been hollowed to produce an extremely light weight ornament. This one is just under 3" tall and 1-3/4" wide. It was sanded to 1000 grit and finished to a high gloss with multiple coats of lacquer. This is a very nice, medium-size ornament turned in our exotic Texas Huisache (aka - Sweet Acacia, pronounced "wee-sash") and Texas Ebony. The color of the globe is the soft orangish/rosy-brown of Huisache; the delicate icicle and capping finial are the very dark-brown color of our south Texas Ebony. 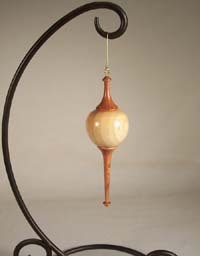 The globe has been hollowed to produce a very lightweight ornament. 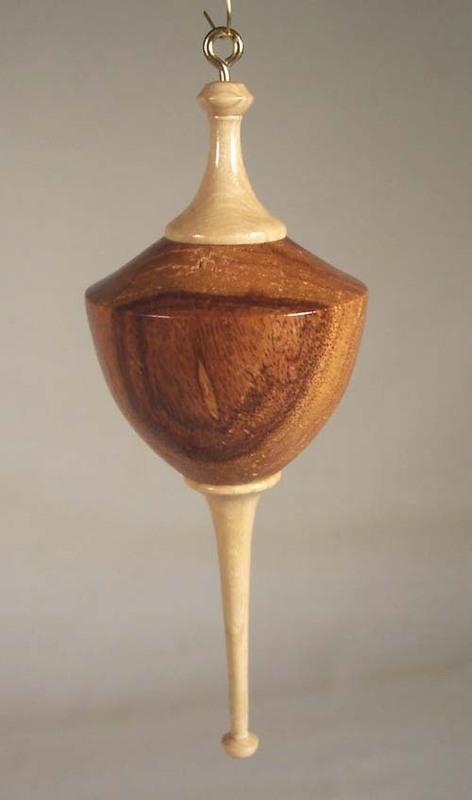 This ornament is approximately 4-1/2" tall and 2" wide. 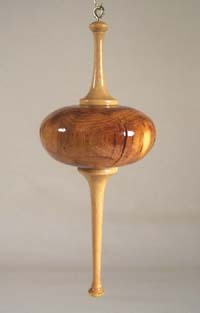 It was sanded to 1000 grit and finished with multiple coats of lacquer. 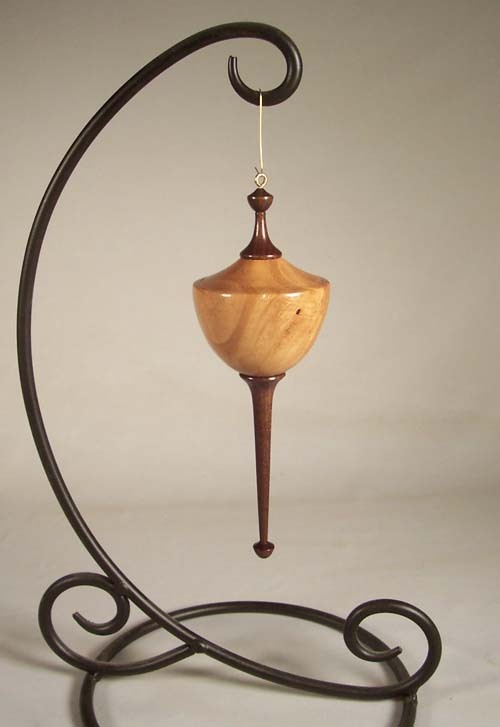 This beautiful small ornament has a globe turned from a very nice piece of classic Texas Honey Mesquite. 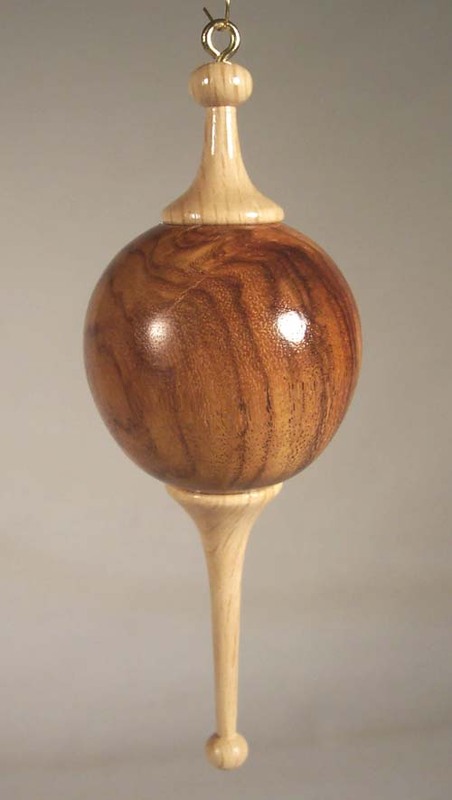 The color of the flattened globe is the strong reddish-brown of Honey Mesquite heartwood. The small capping finial and slender icicle spindle are turned from our exotic, dark brown Texas Ebony found along the Texas-Mexico border. The globe has been hollowed to achieve an extremely light weight. The overall size is just over 3-1/2" tall and just under 2" wide. Finishing included sanding to 1000 grit and multiple coats of lacquer. 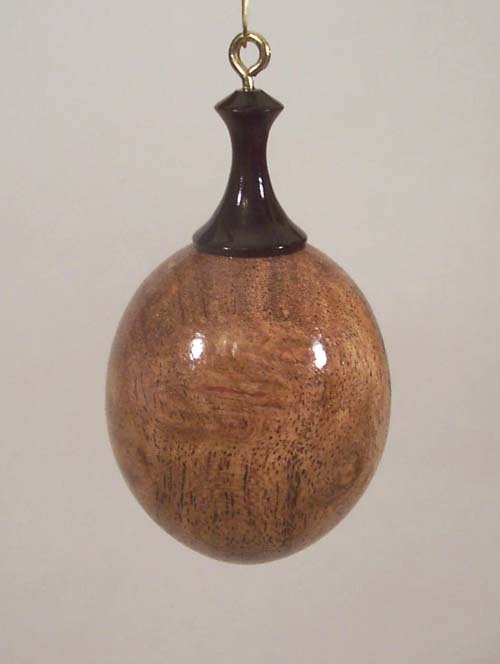 This is a very nice, larger-size ornament turned from our exotic Texas Huisache (aka - Sweet Acacia) and Texas Ebony. 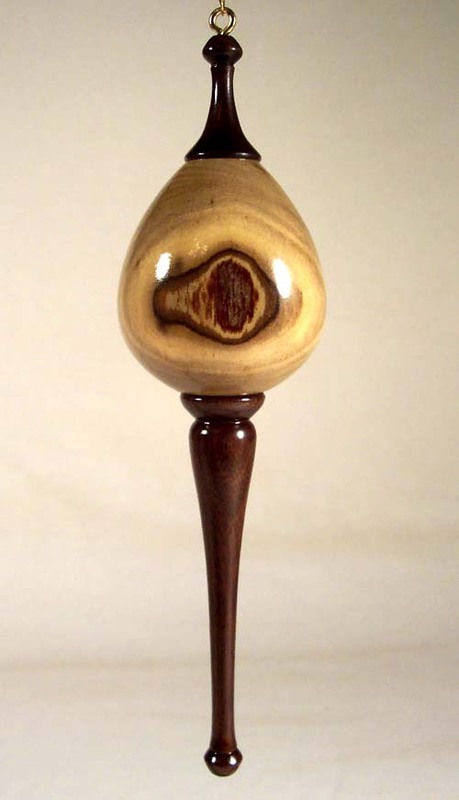 The color of the globe is the soft orangish/rosy-brown of Huisache; the delicate icicle and capping finial are the very dark-brown (almost black) color of our south Texas Ebony. 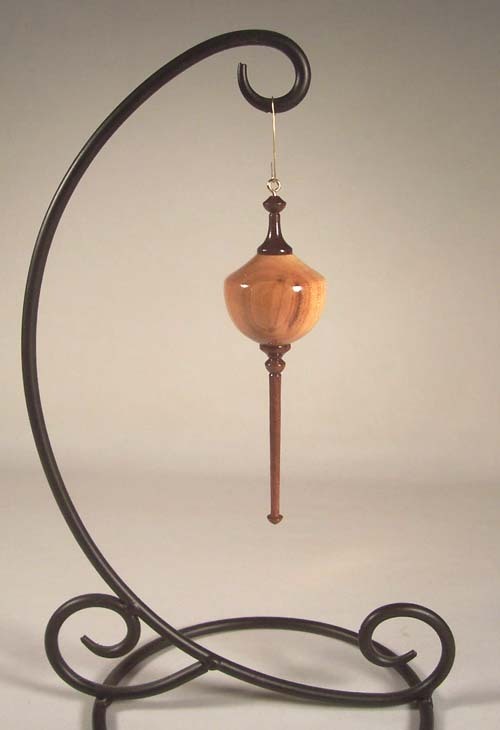 The globe has been hollowed to produce a very lightweight ornament. 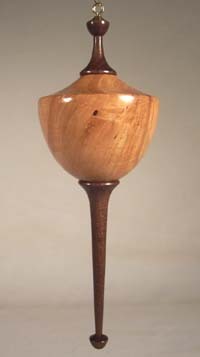 The overall size is 6" tall and 2" wide. Finishing included sanding to 1000 grit and multiple coats of lacquer. 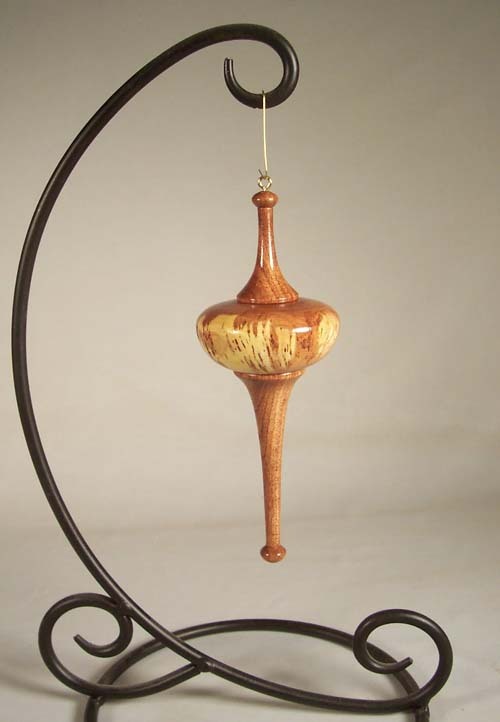 This is a beautiful, medium-size ornament with a flattened globe turned from spalted Texas Sycamore. 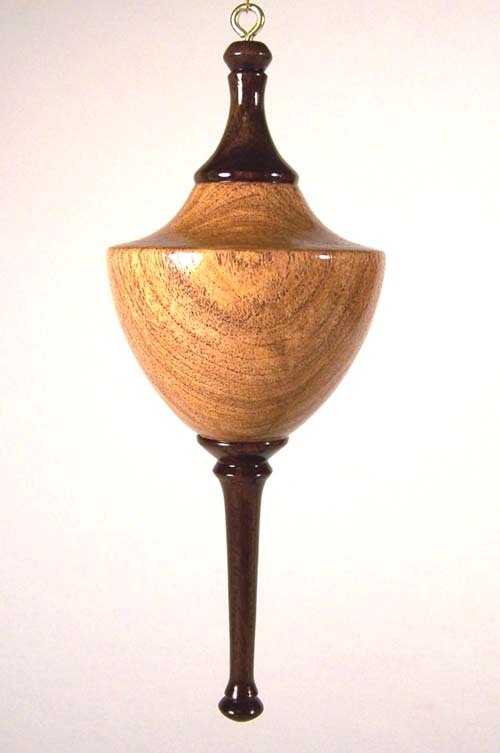 The variations of light to dark brown colors, and complex grain and spalting patterns in the Sycamore globe are very attractive. The small capping finial and delicate icicle spindle are turned from our exotic, dark brown (almost black) Texas Ebony. The globe has also been hollowed to achieve an extremely light weight. The overall size is approximately 5" tall and 2" wide. Finishing included sanding to 1000 grit and multiple coats of lacquer. 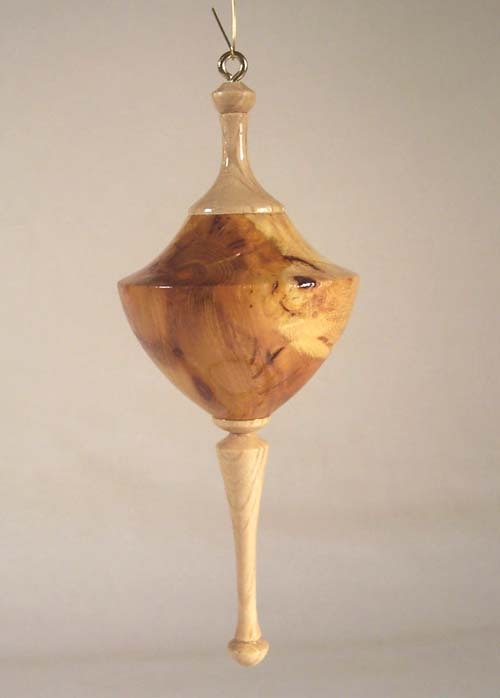 This is another beautiful and fairly large ornament turned from spalted Texas Sycamore and Texas Ebony. The variations of light to dark brown colors, and complex grain and spalting patterns in the Sycamore globe are very attractive. 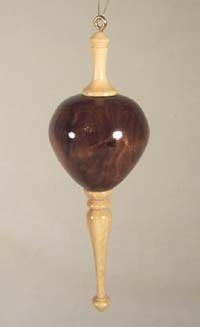 The capping finial and long icicle spindle are turned from Texas Ebony that is very dark brown but includes qolden-brown stripes. The globe has also been hollowed to achieve an extremely light weight. The overall size is approximately 5-3/4" tall and 2" wide. Finishing included sanding to 1000 grit and multiple coats of lacquer. This is a beautiful small ornament turned from spalted Texas Sycamore and Texas Honey Mesquite. 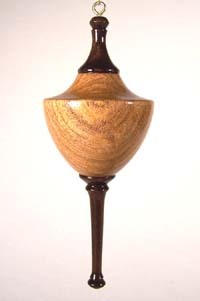 The variations of light to dark brown colors, and complex grain and spalting patterns in the Sycamore globe are very attractive. 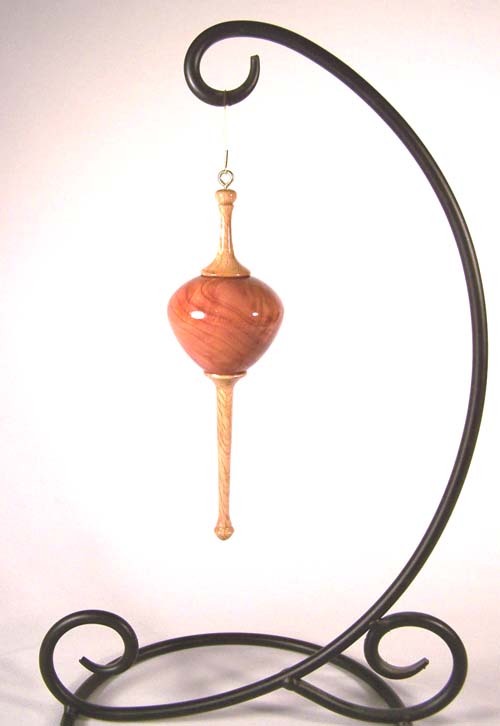 The capping finial and long delicate icicle spindle are the rich, reddish-brown of Mesquite heartwood. 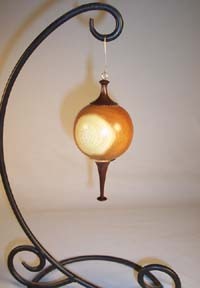 Once again, the globe has been hollowed to achieve an extremely light weight. The overall size is approximately 3-3/4" tall and just under 2" wide. Finishing included sanding to 1000 grit and multiple coats of lacquer. 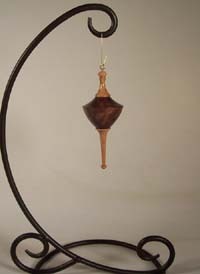 This is another beautiful ornament turned from Black Cherry and Texas Ebony. The color of that graceful globe is the light reddish-brown of Cherry heartwood. The small capping finial and long, slender icicle spindle are turned from our exotic, dark brown and golden-striped Texas Ebony. The globe is also extremely light weight. 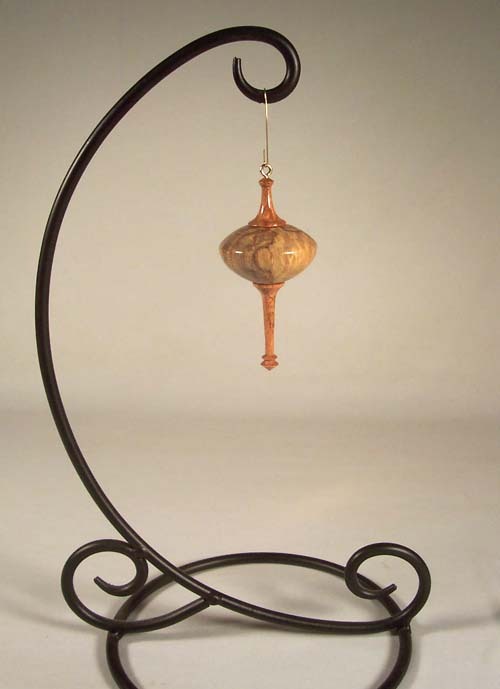 The overall size of this ornament is approximately 6" tall and 2" wide. Finishing included sanding to 1000 grit and multiple coats of lacquer. 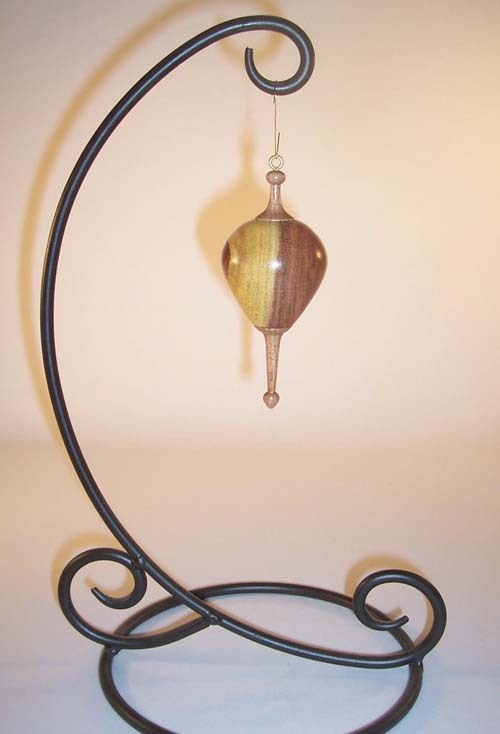 This is a gorgeous little ornament turned from Black Cherry and African Cocobolo (I know - Cocobolo is not a Texas wood, but a friend gave me some and I have to use it somewhere!). The color of that graceful globe is the light reddish-brown of Cherry heartwood. The small capping finial and delicate icicle spindle are turned from dark brown and reddish-striped Cocobolo. The globe is also extremely light weight. The overall size is approximately 4-1/2" tall and 2" wide. Finishing included sanding to 1000 grit and multiple coats of lacquer. This is another beautiful ornament turned from Black Cherry and Texas Ebony. 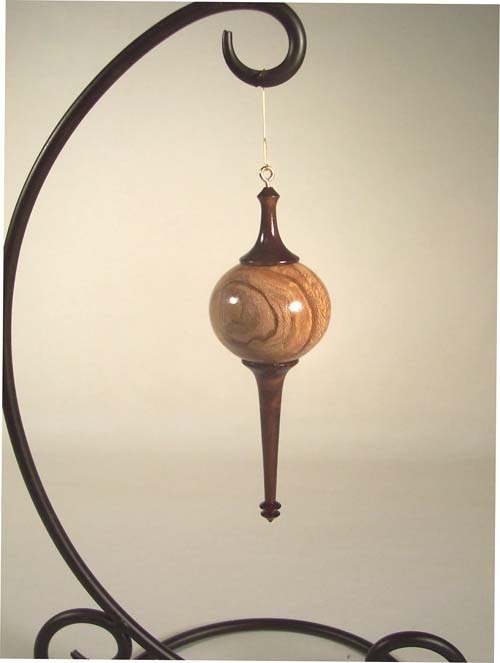 The color of that elongated globe is the light reddish-brown of Cherry heartwood. 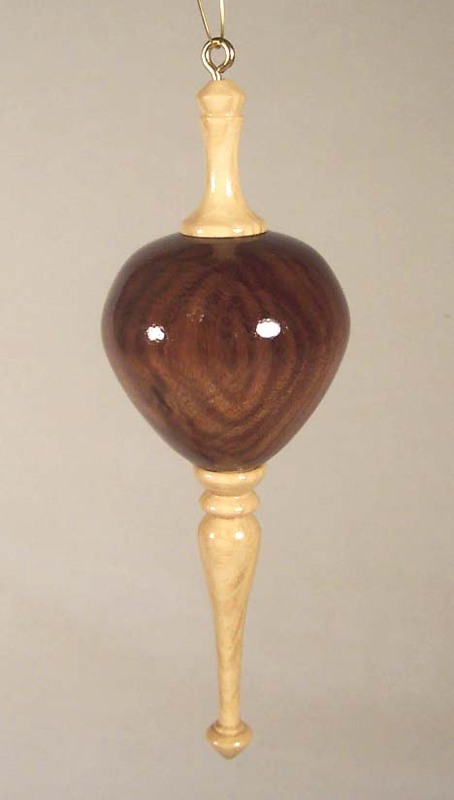 The small capping finial and slender icicle spindle are turned from our exotic, dark brown (almost black) Texas Ebony. The globe is also extremely light weight. The overall size of this ornament is approximately 5-1/4" tall and 2" wide. Finishing included sanding to 1000 grit and multiple coats of lacquer. This is a very nice spherical globe ornament turned in Texas Bodark (Bois d'Arc or Osage Orange) with a finial and icicle of Texas Ebony. When initially turned in 2008, the globe was a light yellowish orange of Bodark heartwood, with a large patch of cream colored sapwood. with a delicate icicle and capping finial in very dark-brown with faint coffee-cream stripes. 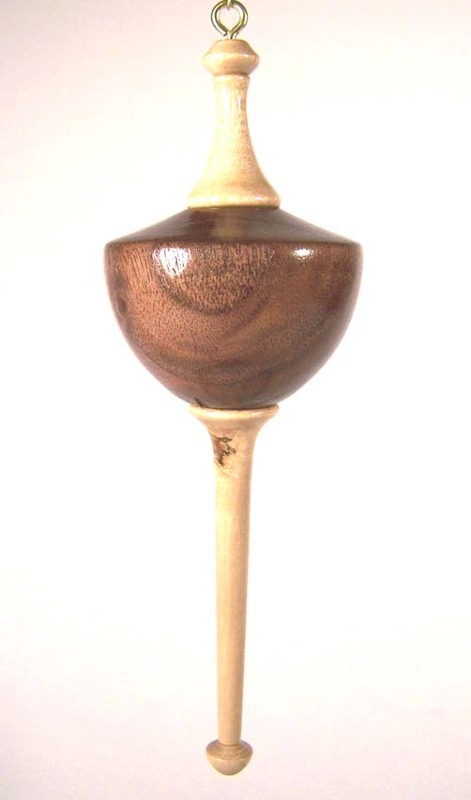 It is now 3 years old and that Bodark globe has aged as Bodark typically does - darkened to a beautiful golden-brown. I have attached additional photos so you can see the dramatic color change. If it is like other Bodark pieces that I have turned - that color will only get darker and more beautiful with age! 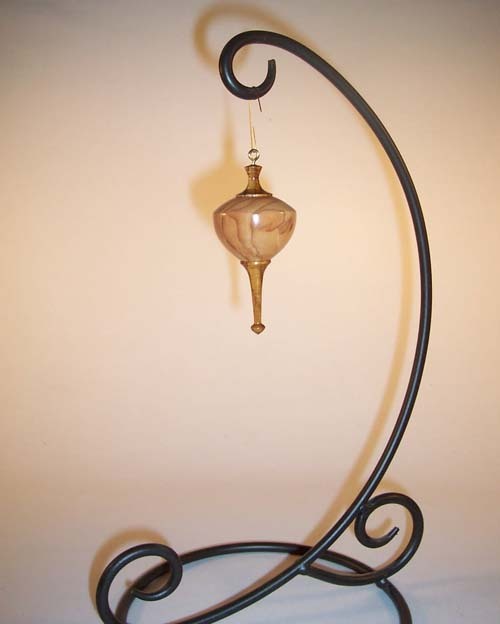 This ornament is just over 5" tall and almost 2-1/2" wide. 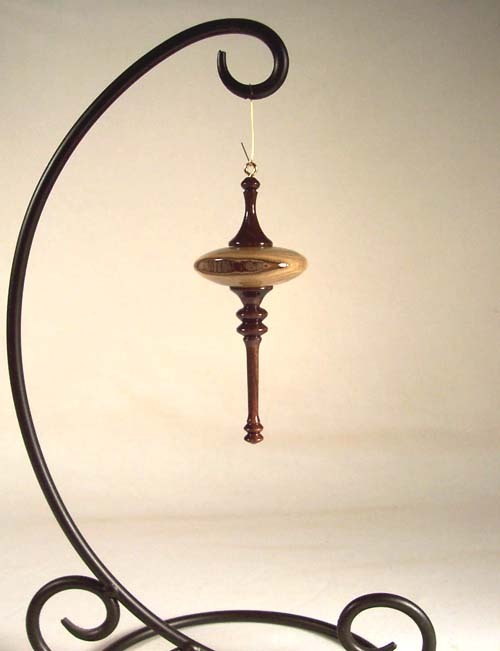 The globe has been hollowed to create a very lightweight ornament. 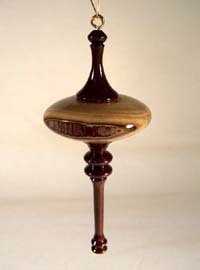 It was sanded to 600 grit and finished with multiple coats of lacquer. This is a beautiful and delicate ornament in a heavily spalted Texas Pecan and Texas Ebony. 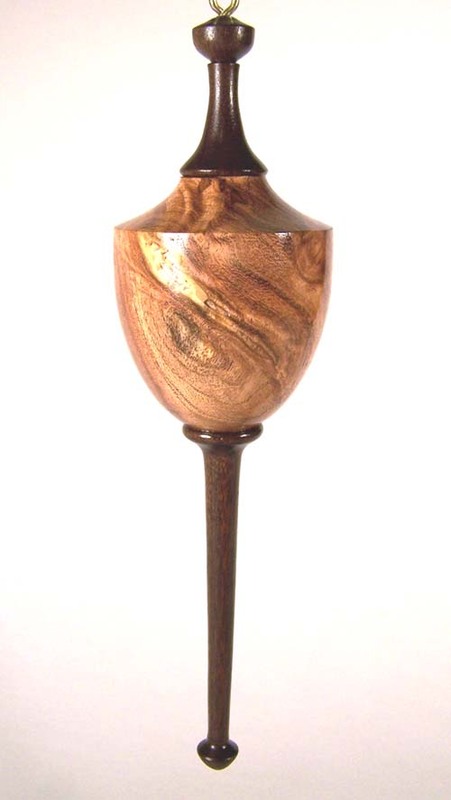 The colors of the globe in the photos are true - the rich brown of Pecan heartwood with gracefully-flowing, darker brown spalt lines which cross the less-distinct grain pattern of the wood. The finial and spindle "icicle" are pure Texas Ebony heartwood, but is a strong brown rather than the dark brown to almost black of most of my Ebony. 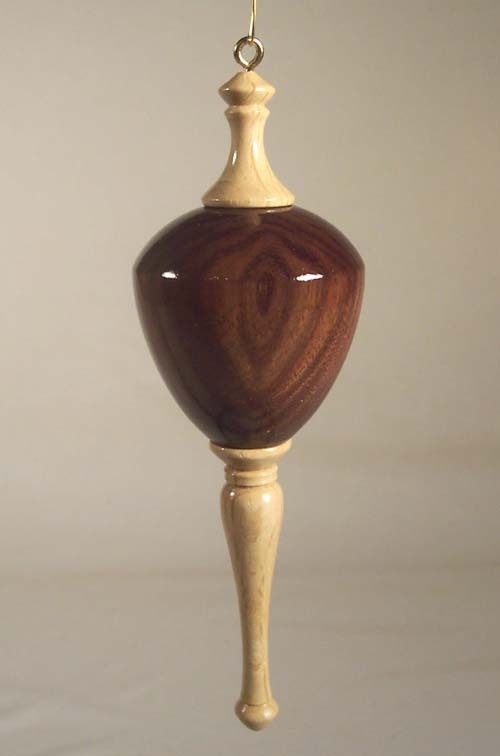 I deliberately picked that brown Ebony because the colors go together so nicely. The globe has been hollowed to produce an extremely light weight ornament. 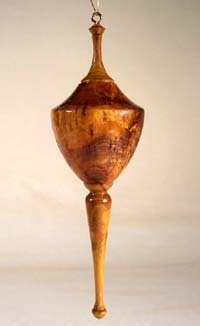 It is approximately 3-1/2" tall and 1-3/4" wide. It was sanded to 1000 grit and finished to a high gloss with multiple coats of lacquer. This is another nice pierced-globe ornament turned in Texas Honey Mesquite with a delicate icicle of Texas Live Oak. A small pewter cross is suspended in the hollow center of the globe. It was sanded to 600 grit and finished with multiple coats of lacquer. It is approximately 4" tall and 2" wide. This is another beautiful, lightweight ornament turned from spalted Texas Live Oak. The color is a very nice combination of light and dark browns with delicate black spalt lines; the grain pattern is strong and attractive. 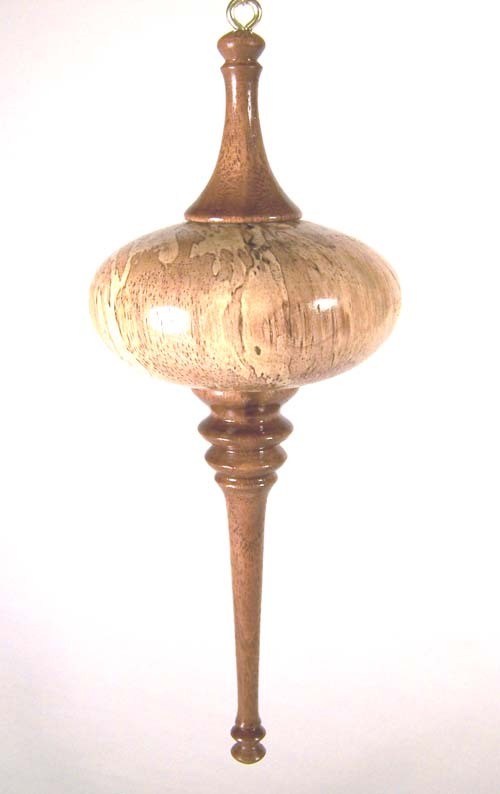 The globe is gracefully tapered and has been hollowed to achieve a very light weight. The delicate icicle spindle and capping finial are turned from Texas Ebony. 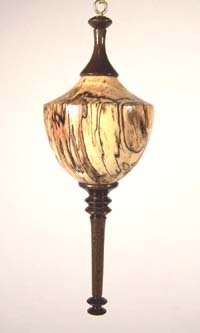 The overall size is approximately 5" tall and 2" wide. Finishing included sanding to 600 grit and multiple coats of lacquer. 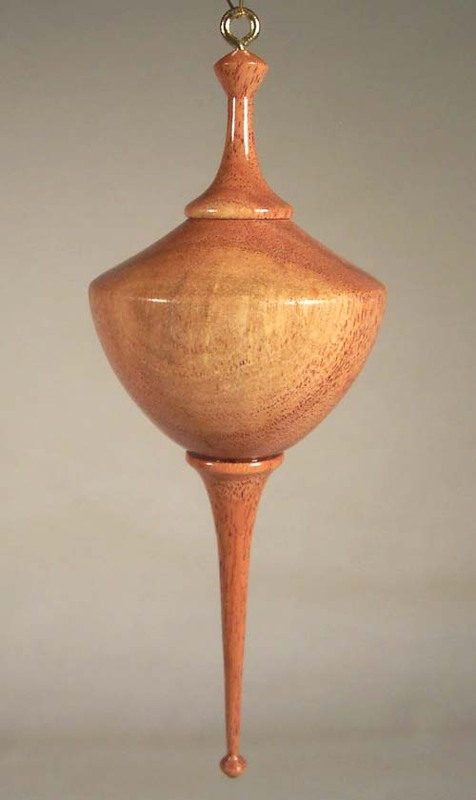 This is another beautiful, lightweight ornament turned from Texas Honey Mesquite. That tapered Mesquite globe has been hollowed to produce a very lightweight ornament that will not drag down the branch when hung on your tree. The delicate icicle spindle and capping finial are turned from Texas Ebony. 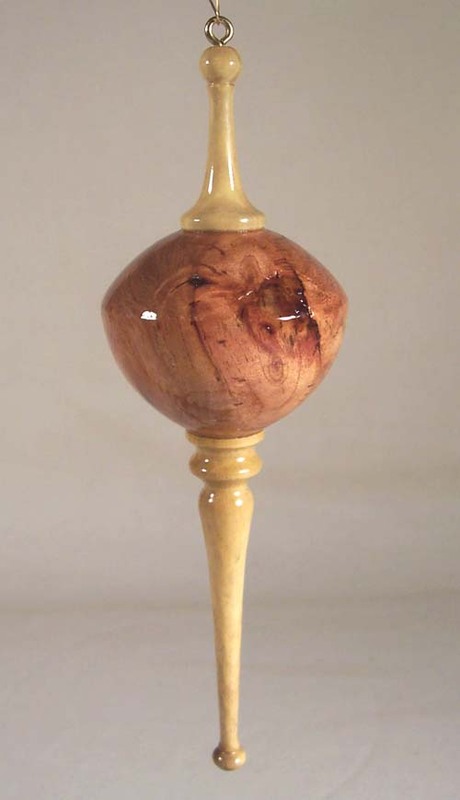 The colors of the globe include both the reddish honey brown typical of Texas Mesquite and the brownish yellow of the Mesquite sapwood; a patch of bark was deliberately left on the side of the sapwood to form a dark brown spot in the center of that yellow sapwood. The overall size is approximately 4-1/2" tall and 2" wide. Finishing included sanding to 600 grit and multiple coats of lacquer. Note, the stand is not for sale. 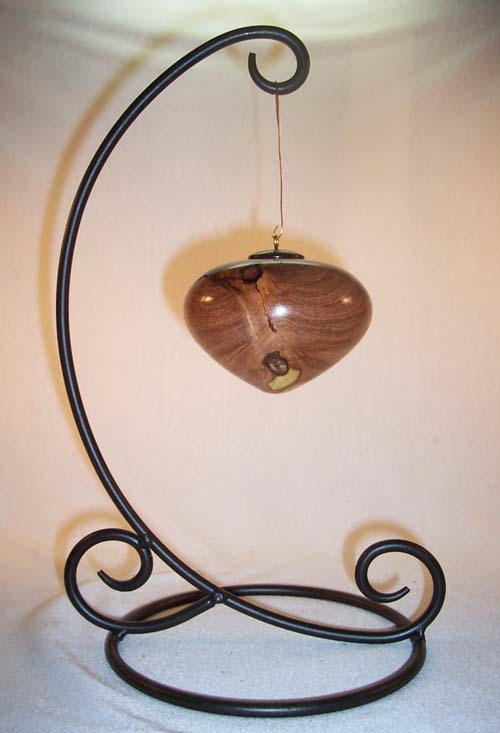 This is a large, beautiful heart-shaped, hollow-form ornament turned from Texas Honey Mesquite. 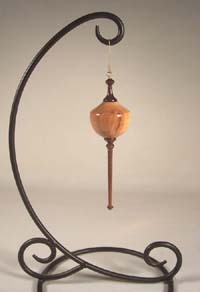 The globe has been hollowed to substantially reduce the total weight, however, due to its overall size, it would not be called light-weight. The capping finial is turned from Texas Ebony. The color is the strong reddish brown typical of Texas Honey Mesquite. Three small areas of dark-brown "included bark" and several open but tight cracks are present and preserved on the sides of the globe. 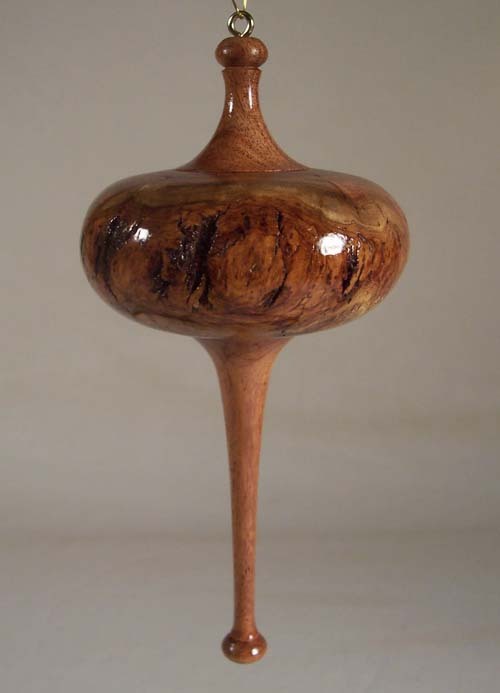 The strong Mesquite grain pattern swirls around the areas of bark and is intersected by the cracks. Two small areas of yellow mesquite sapwood are present on the bottom. 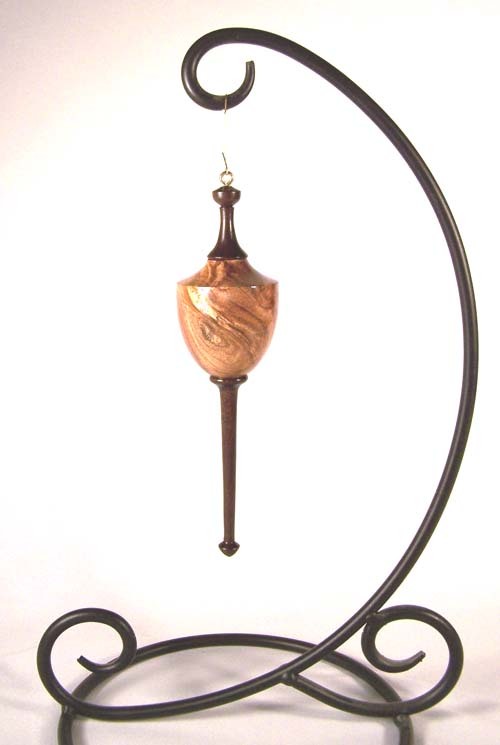 The overall size of this ornament is approximately 3" tall and 4" wide. Finishing included sanding to 600 grit and multiple coats of lacquer. Note, the stand is not for sale. 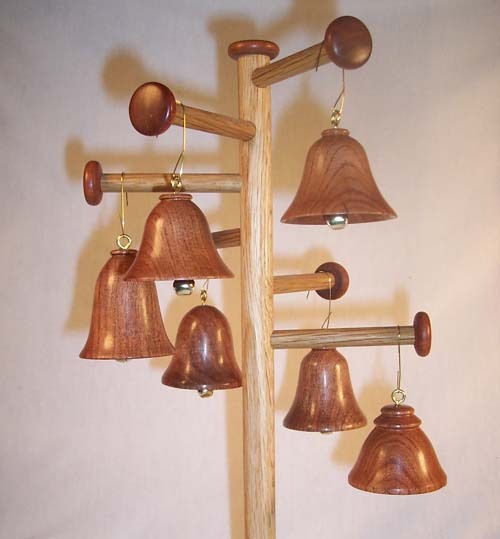 I have recently turned a number of small, delicate Christmas bells in Texas Honey mesquite. 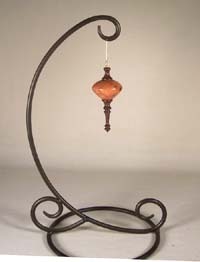 The are generally 1-3/4 to 2-1/4 inches high and 2 inches wide. 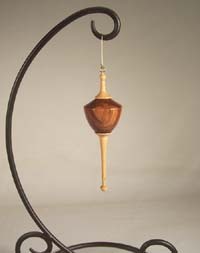 The color is the classic honey brown of Mesquite heartwood, set off by a small brass bell just inside to serve as a "clapper". 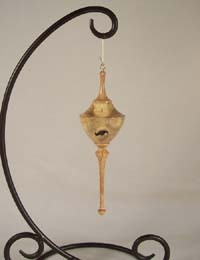 The other hardware (the wire and eye screws) is also brass. 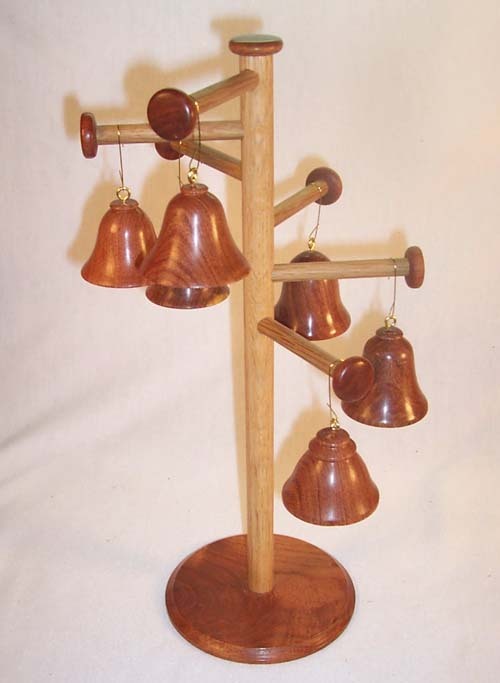 As with most of my turnings, these bells are well sanded, finished with Danish oil, and then buffed and waxed to a satin sheen. 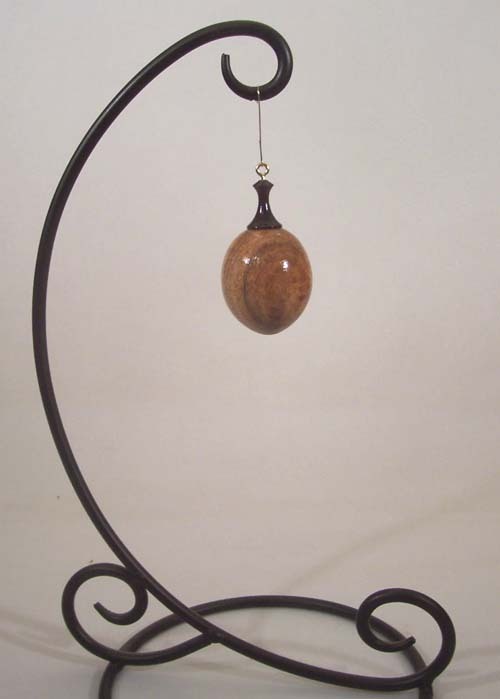 They are available for sale individually (the stand is not included).